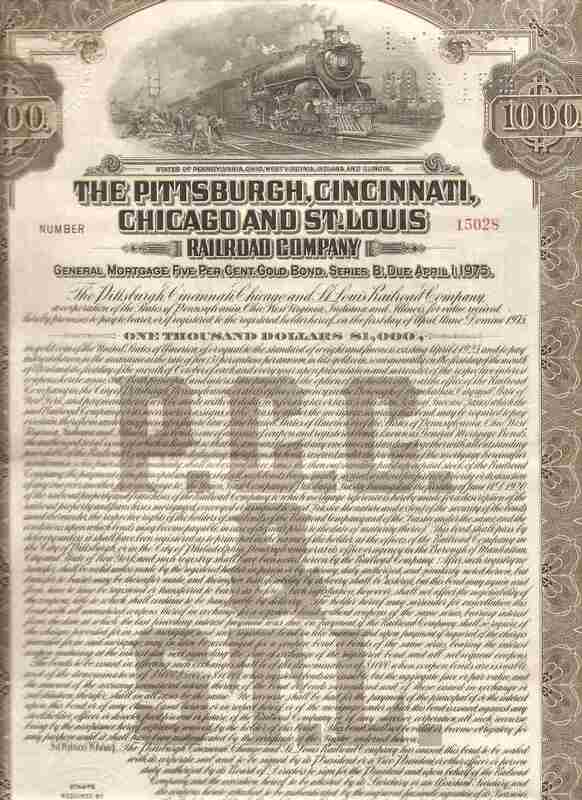 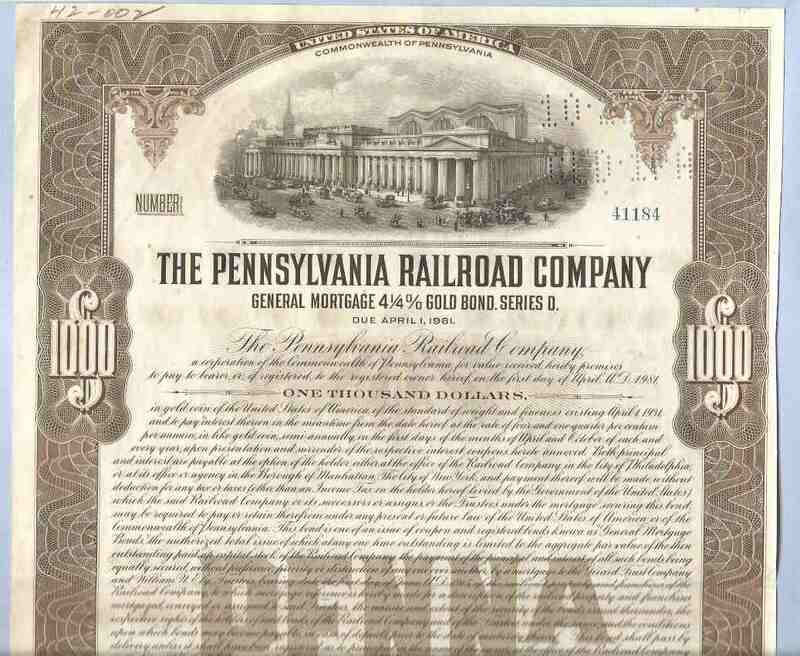 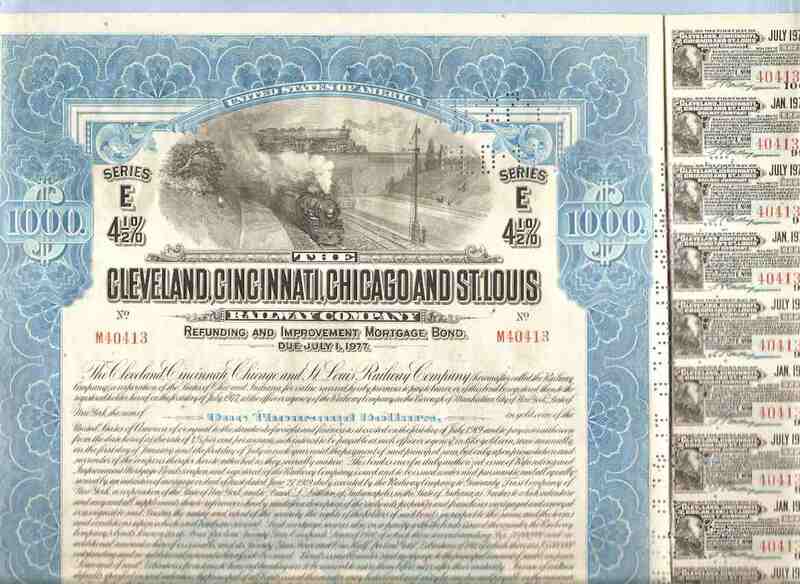 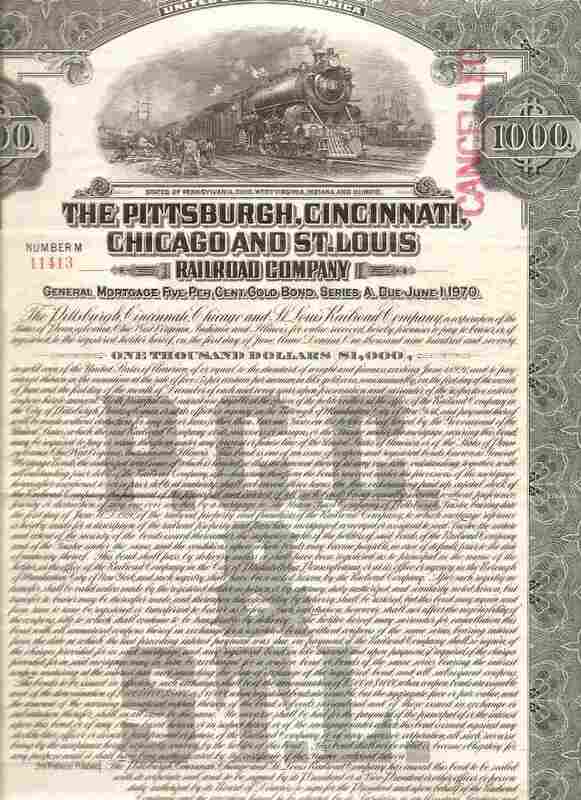 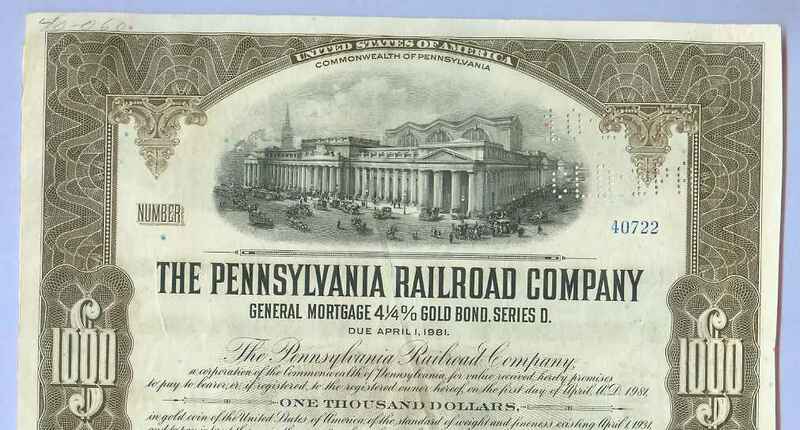 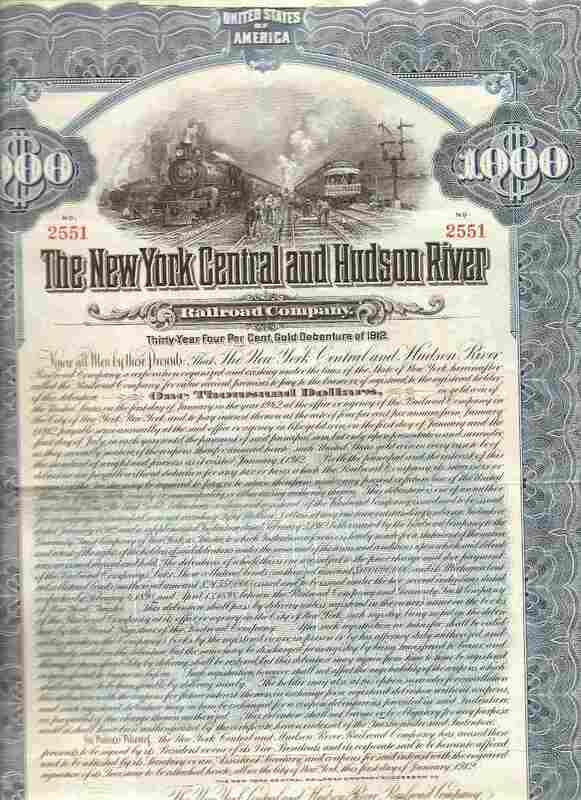 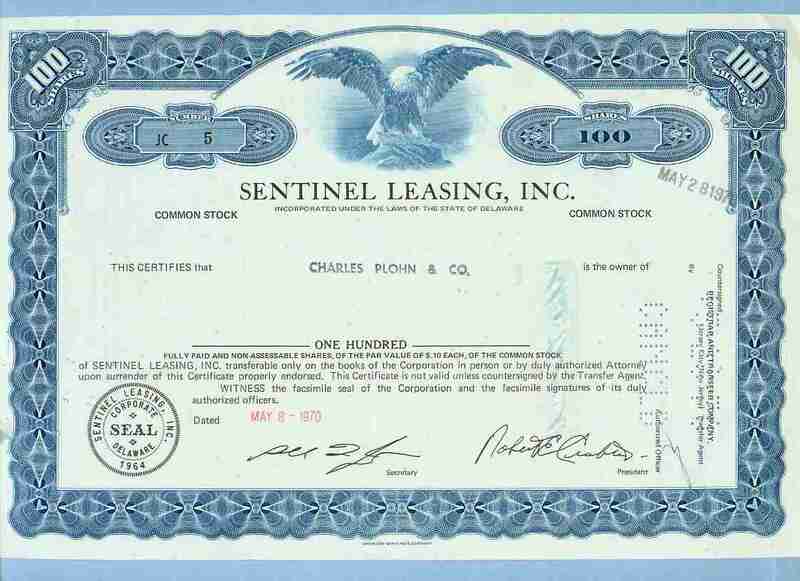 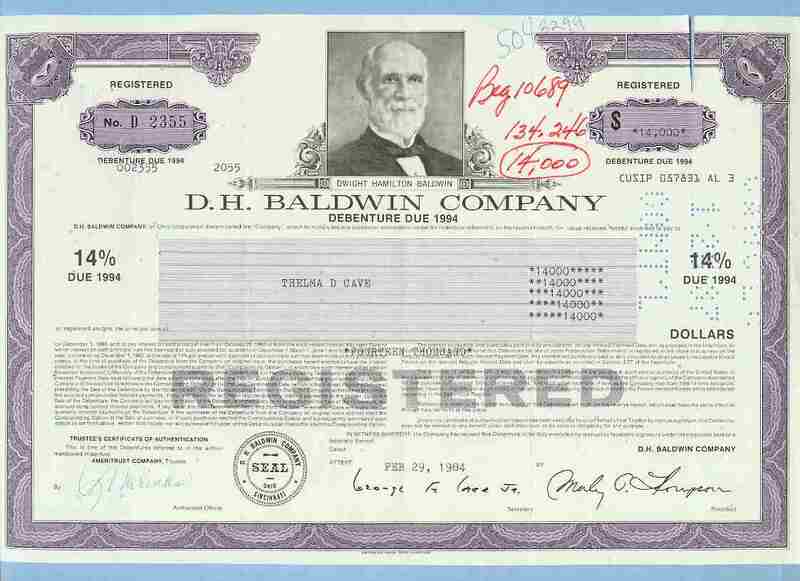 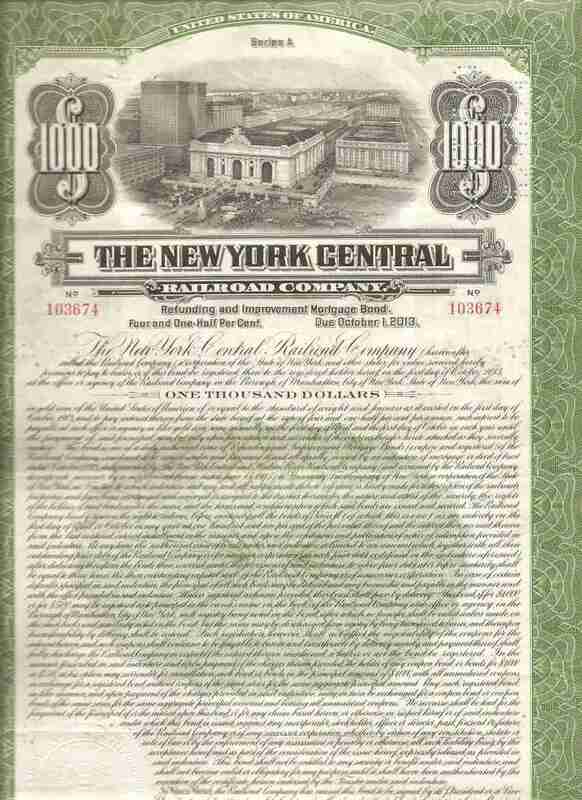 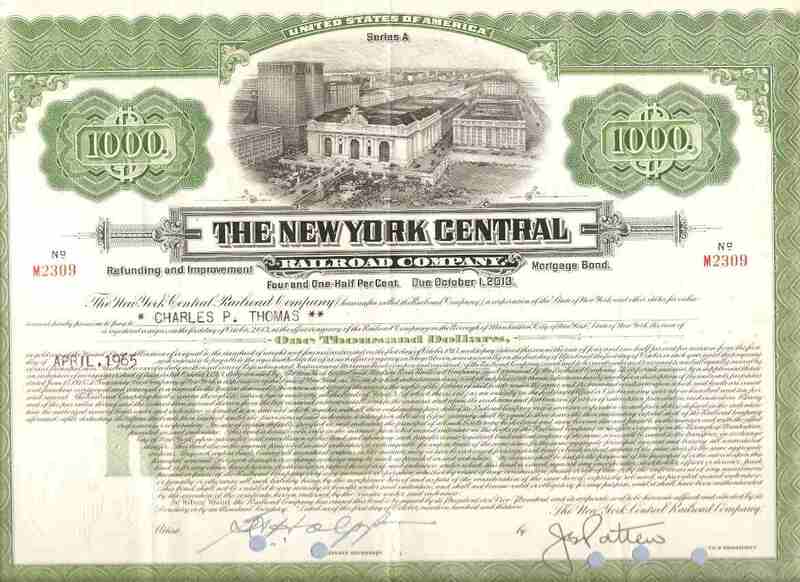 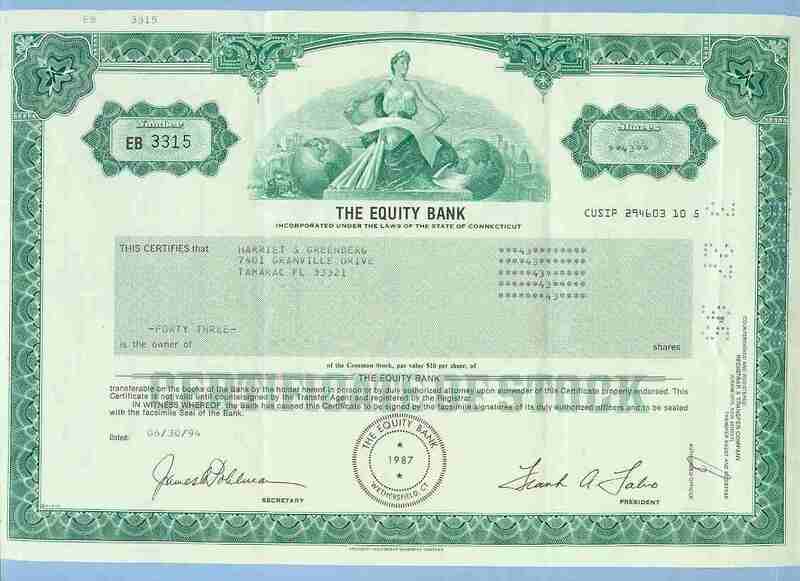 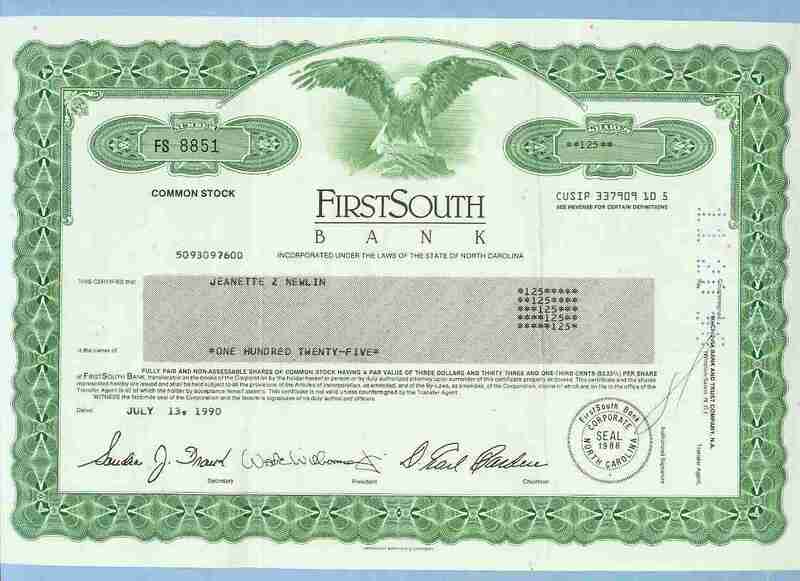 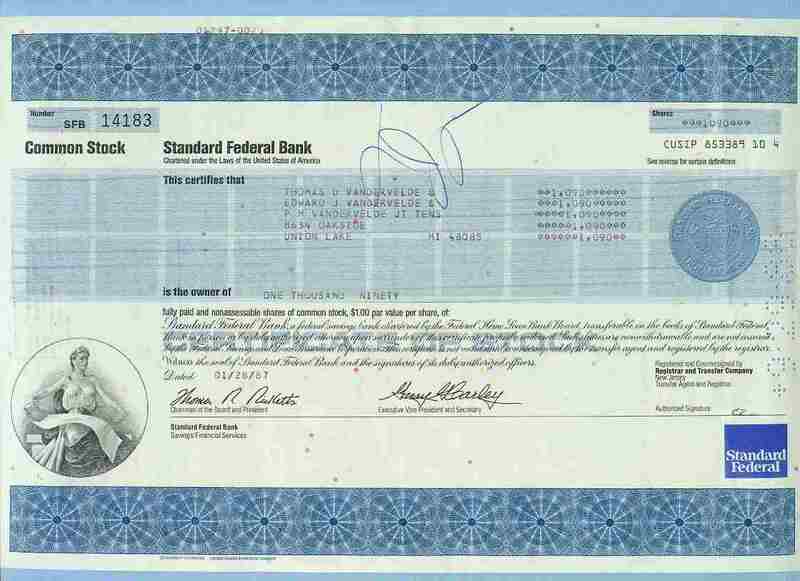 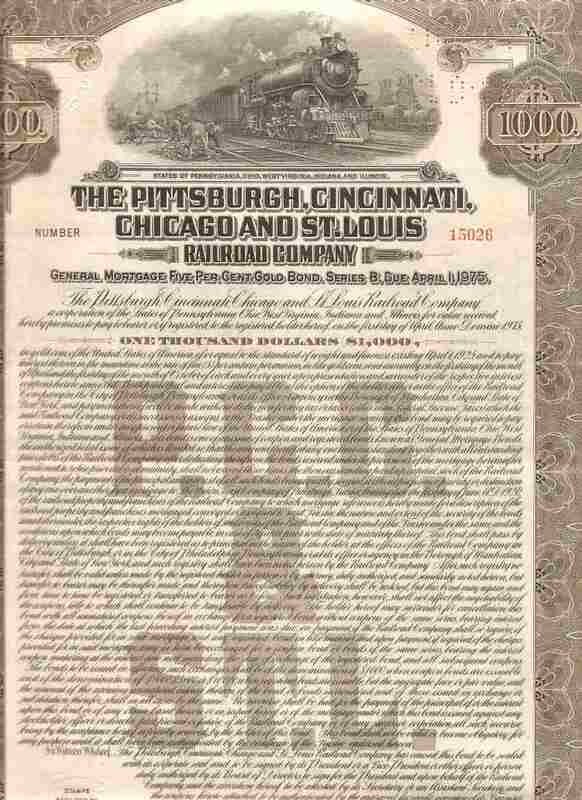 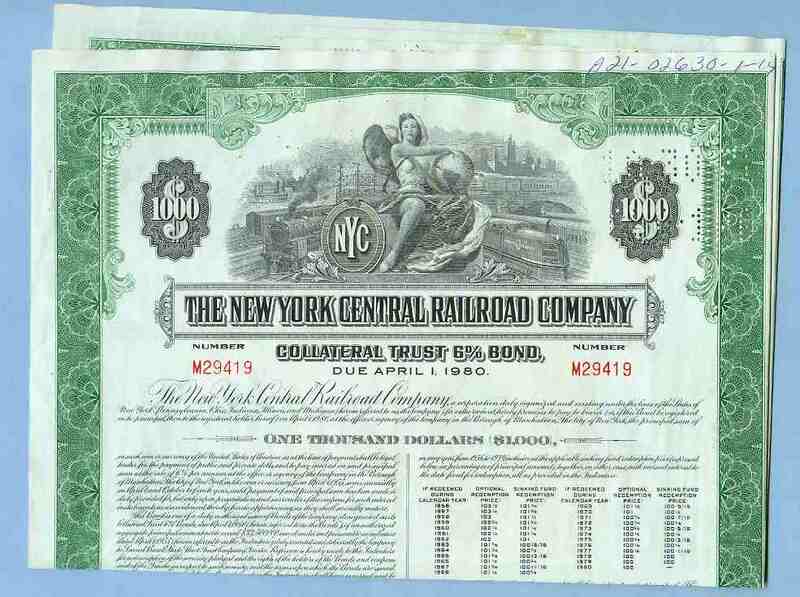 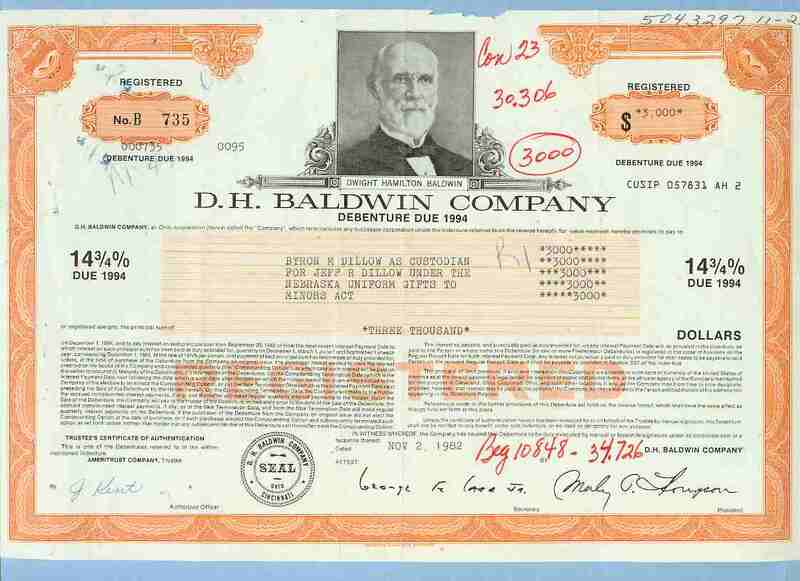 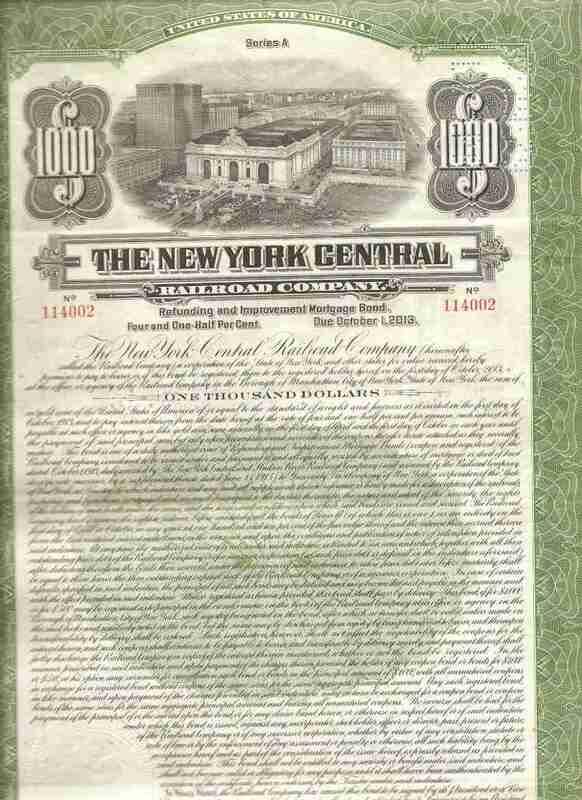 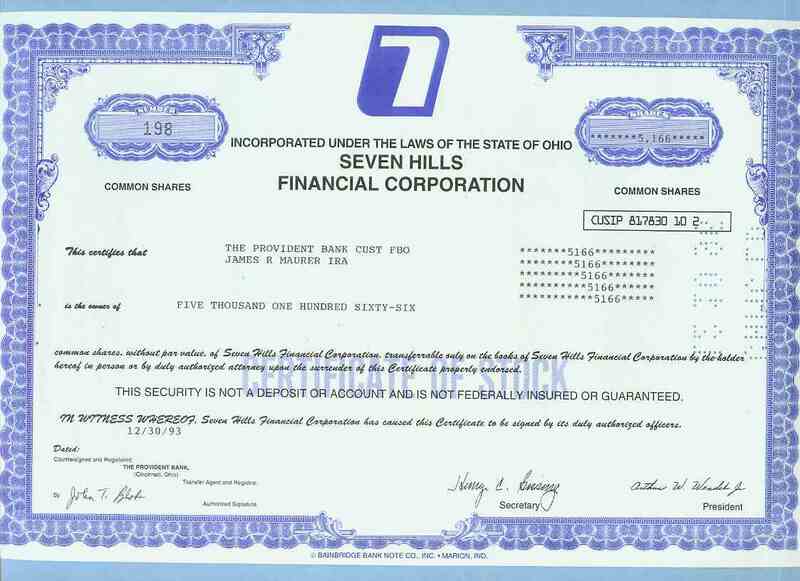 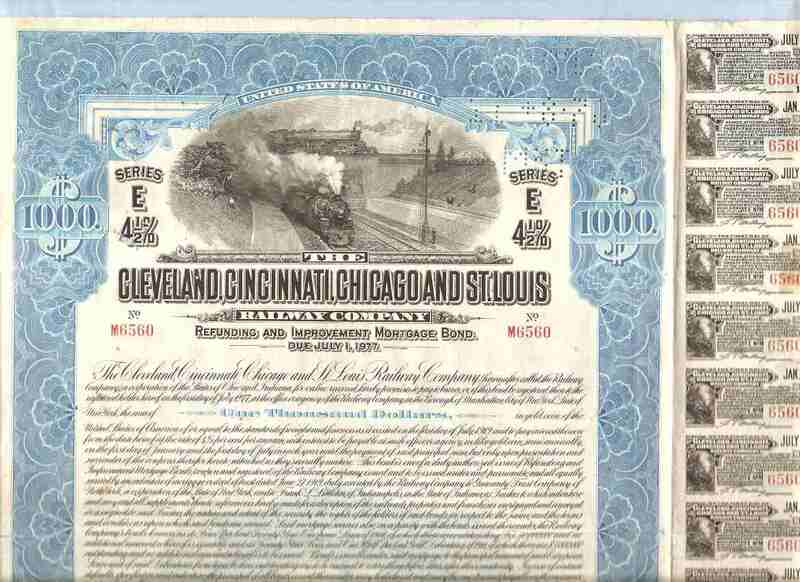 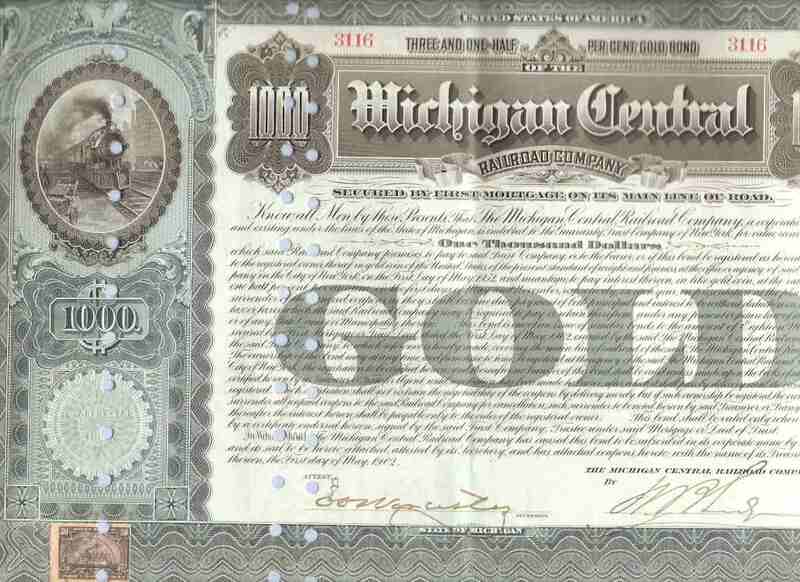 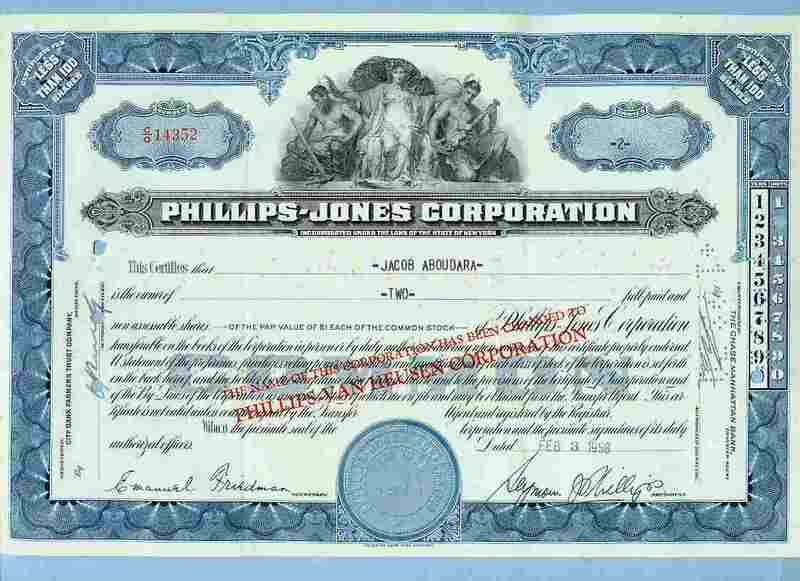 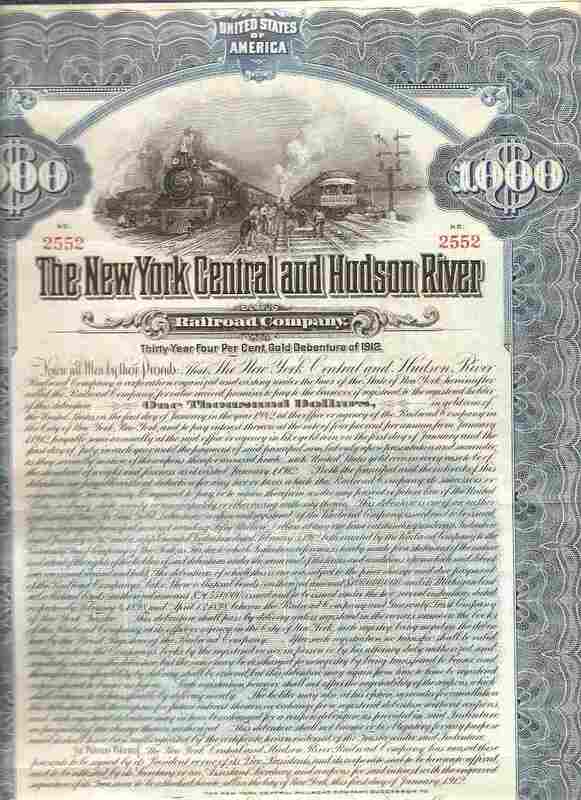 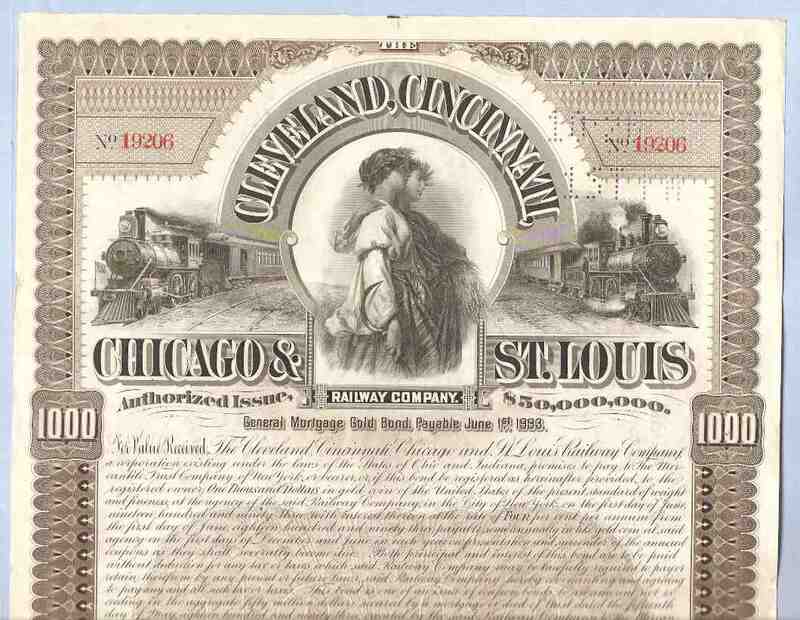 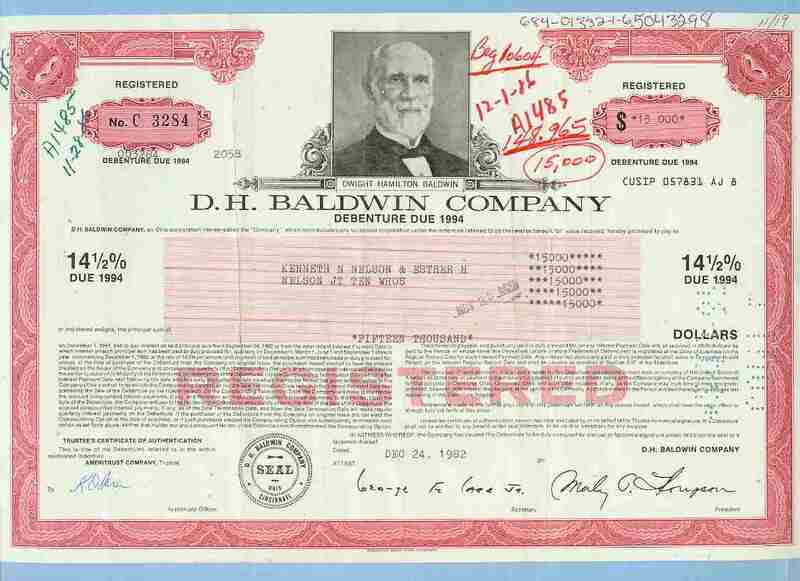 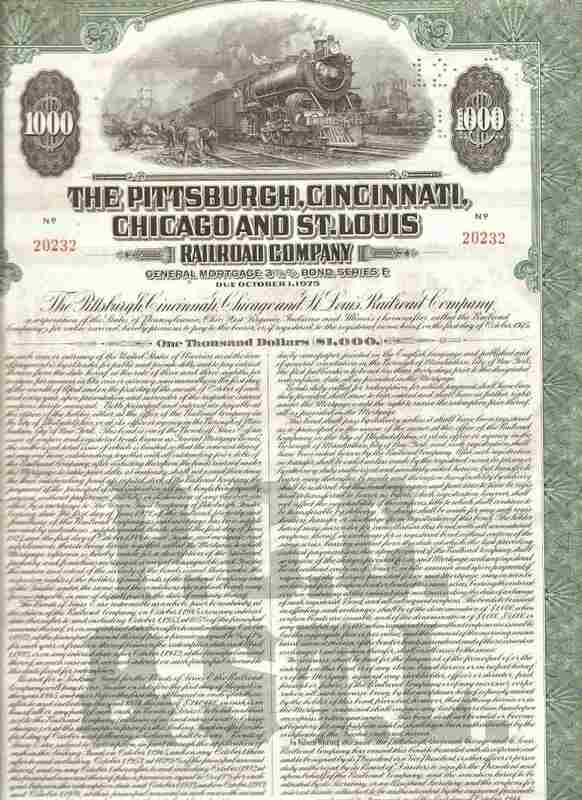 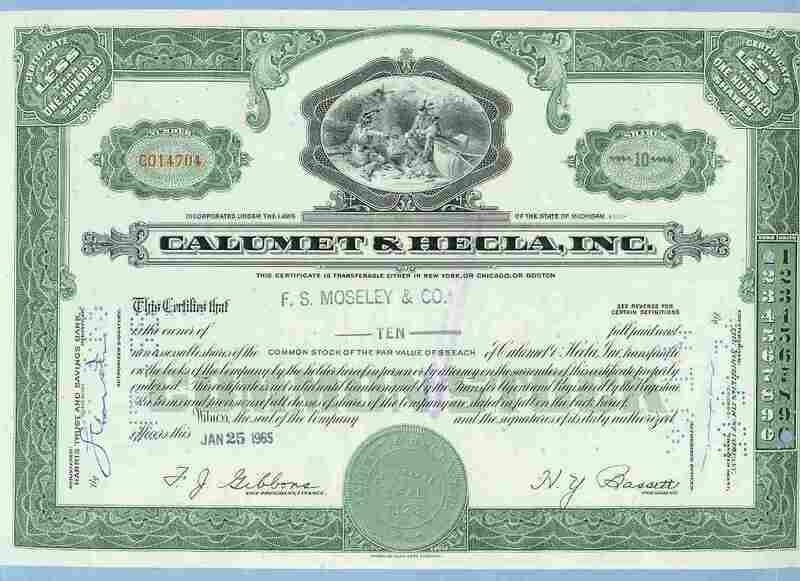 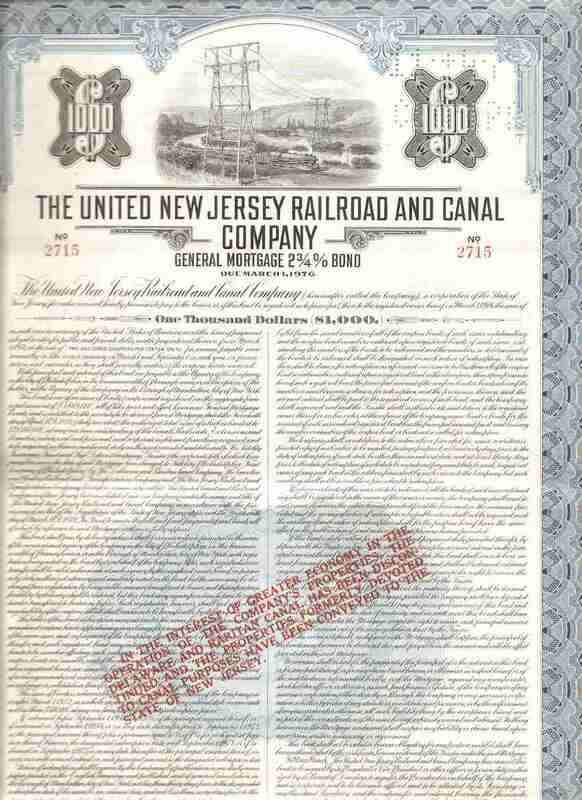 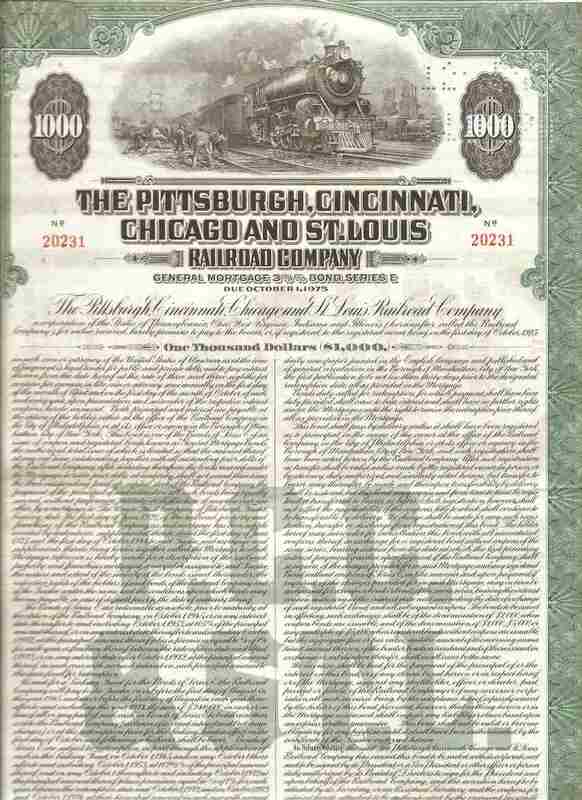 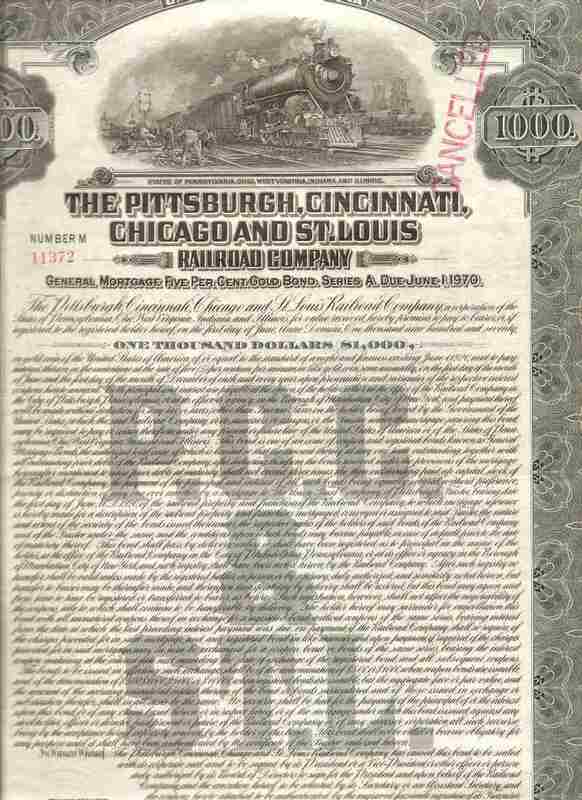 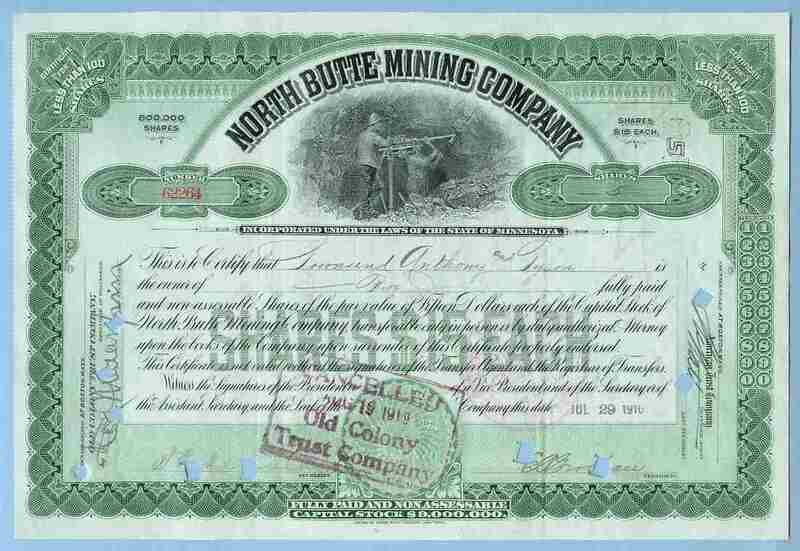 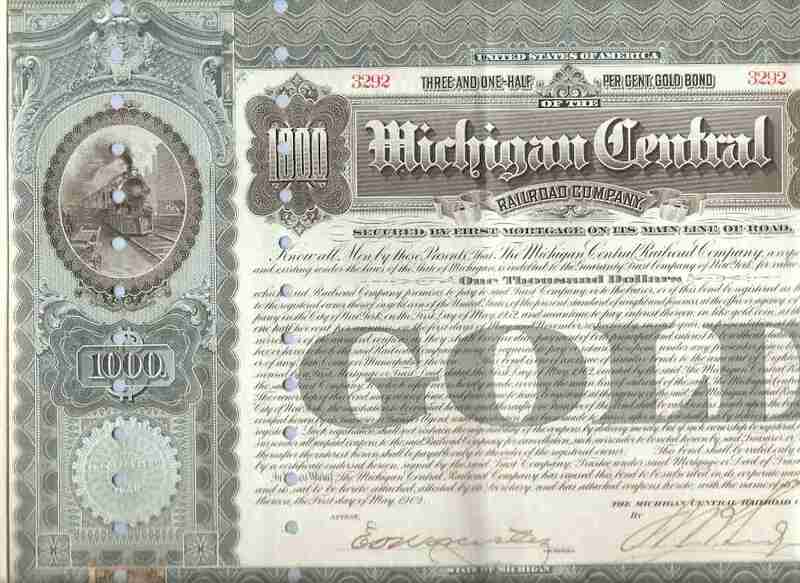 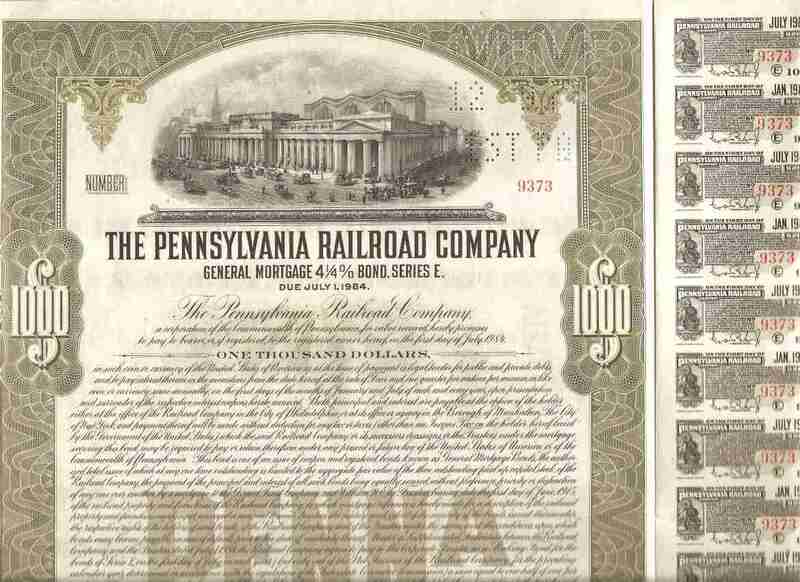 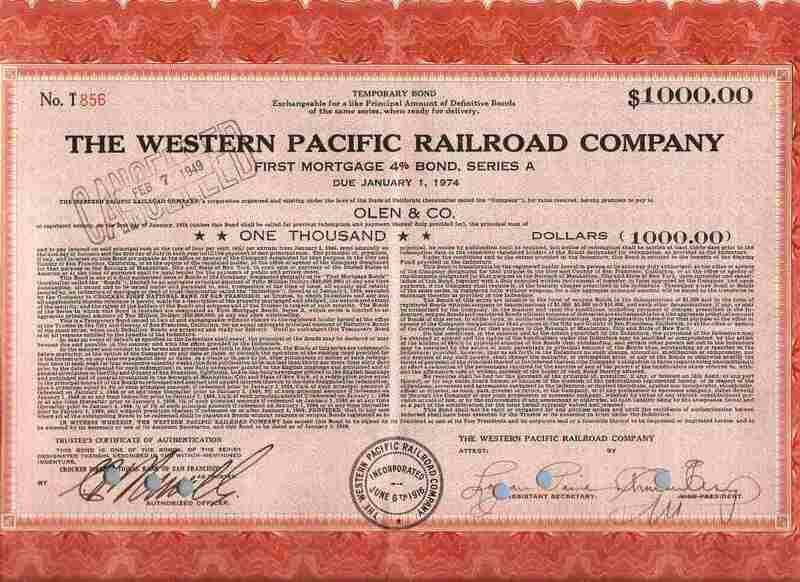 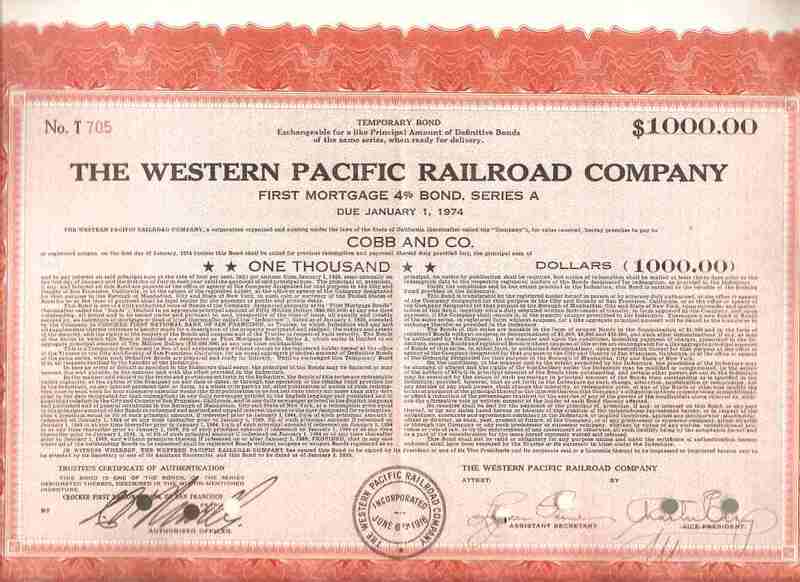 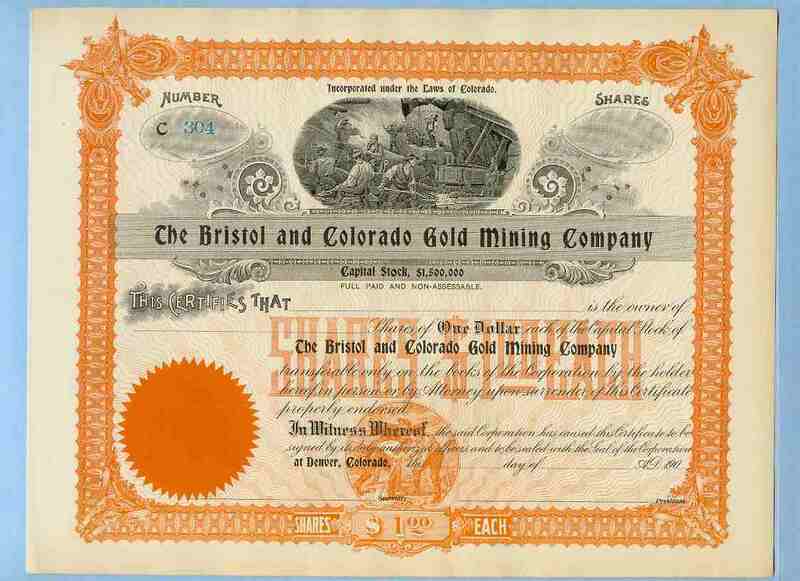 Scripophily is the study and collection of stock and bond certificates. 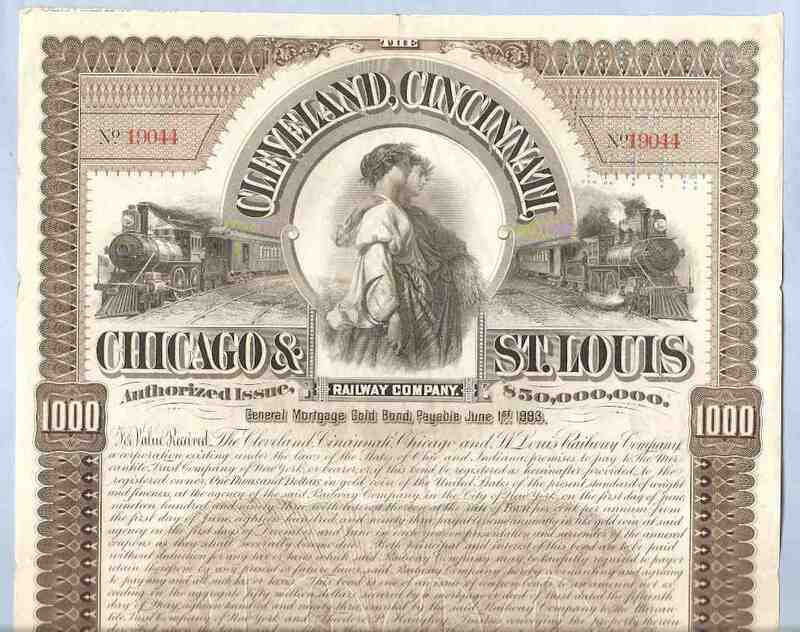 A specialized field of numismatics, scripophily is an interesting area of collecting due to both the inherent beauty of some historical documents as well as the interesting historical context of each document. 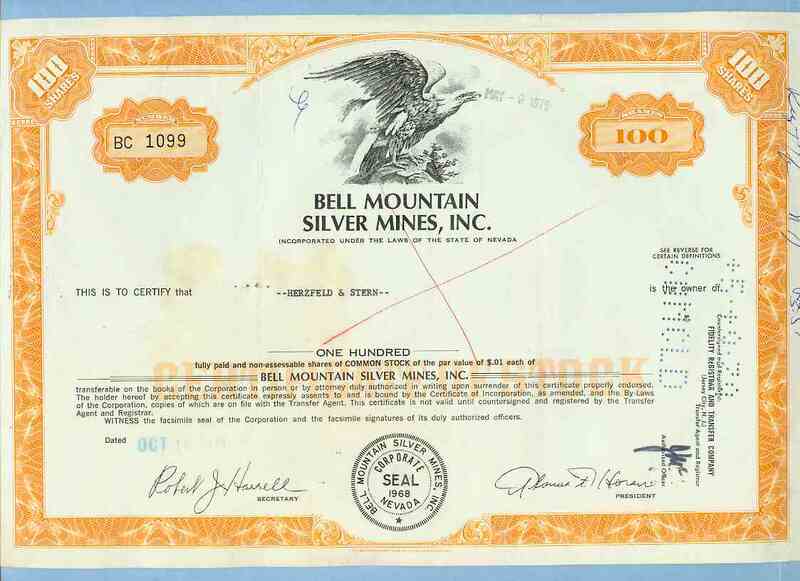 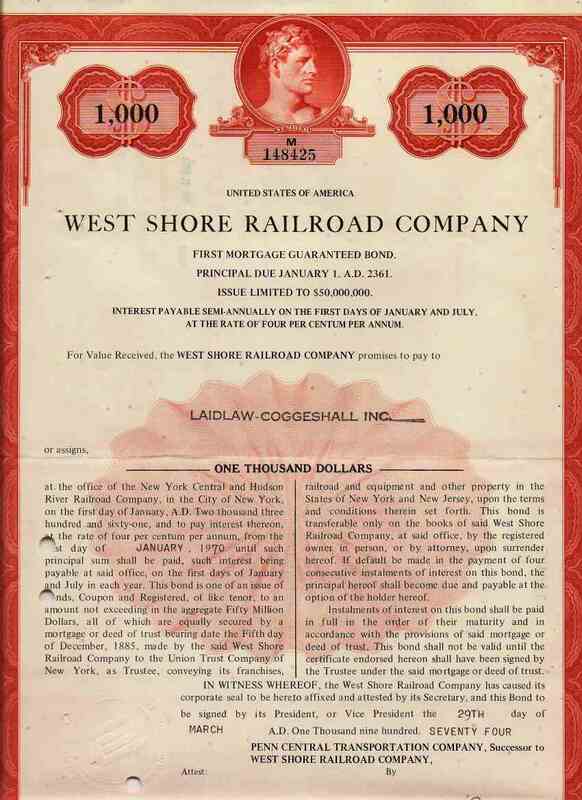 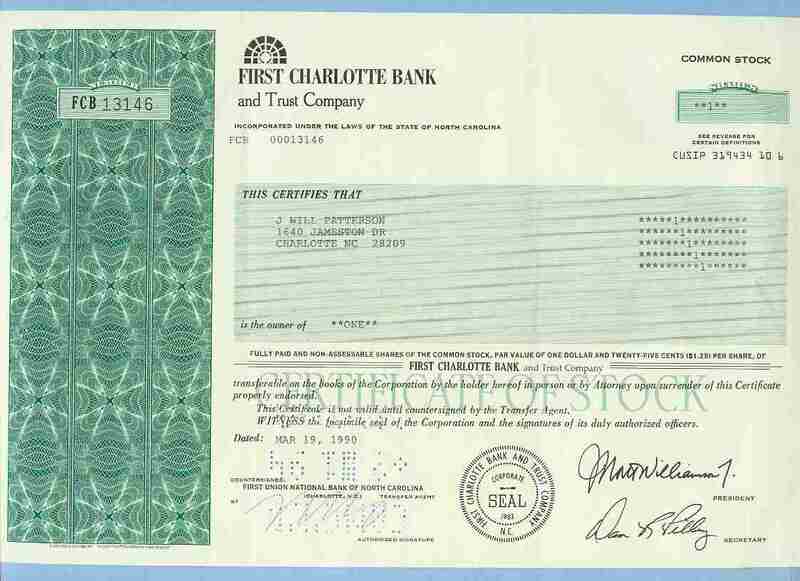 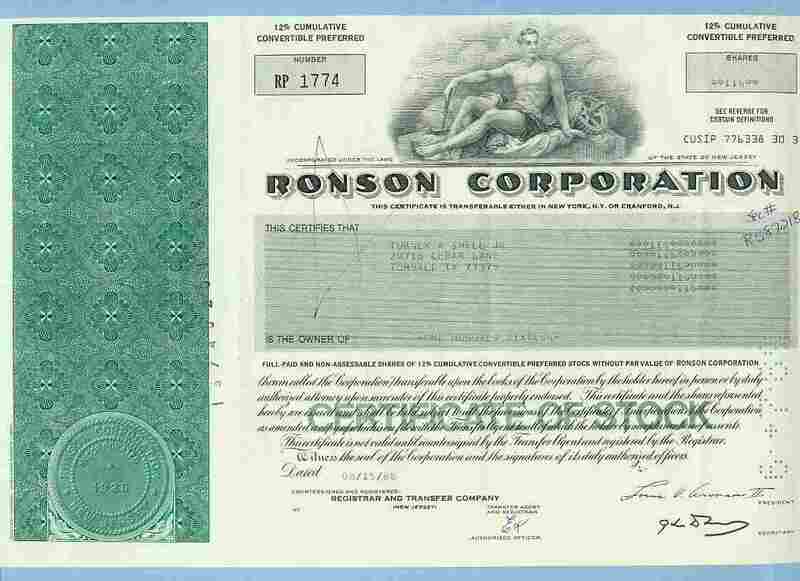 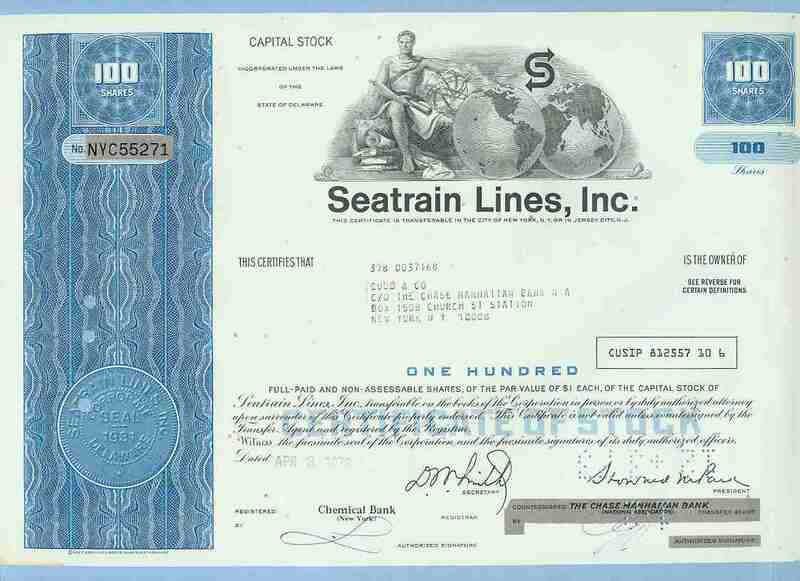 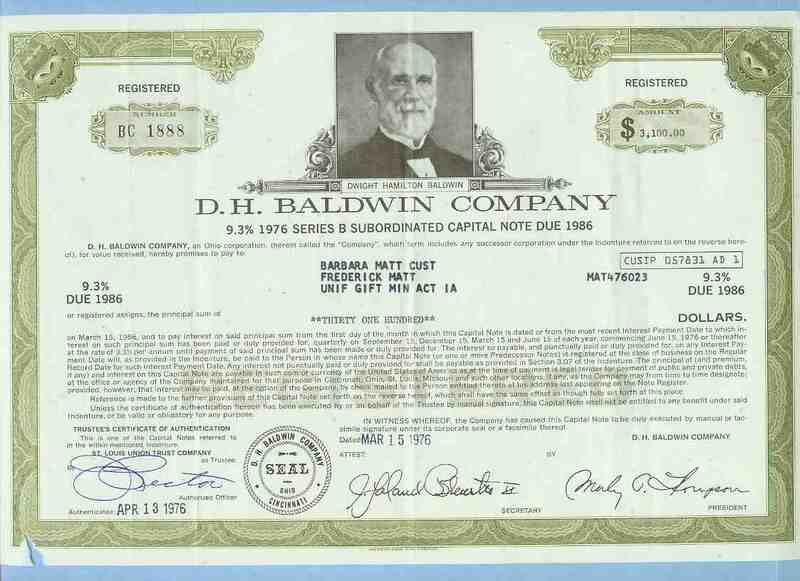 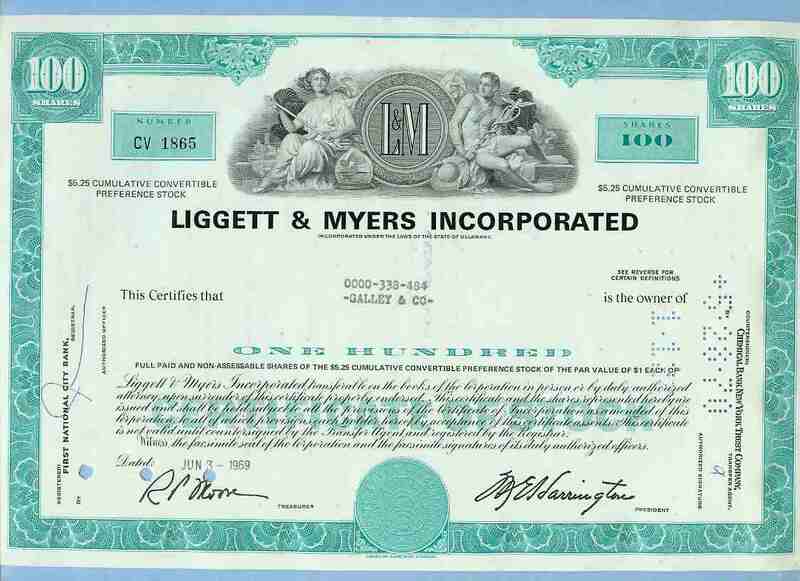 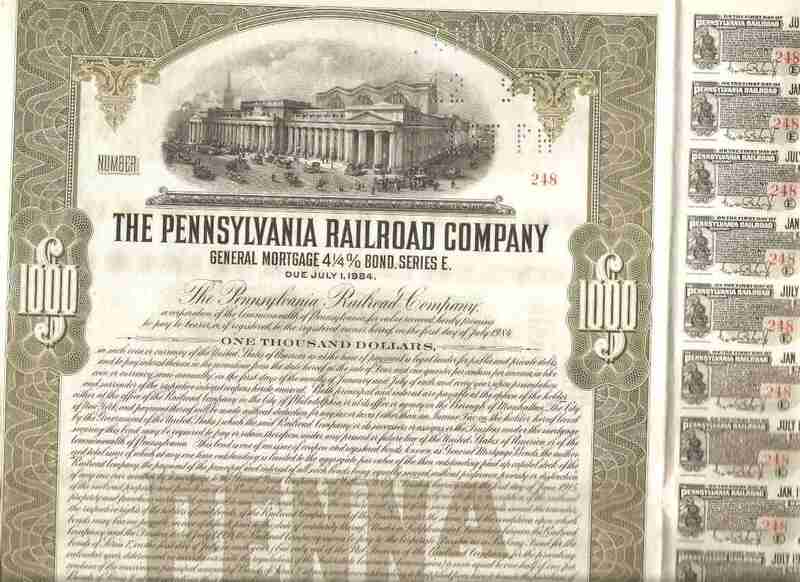 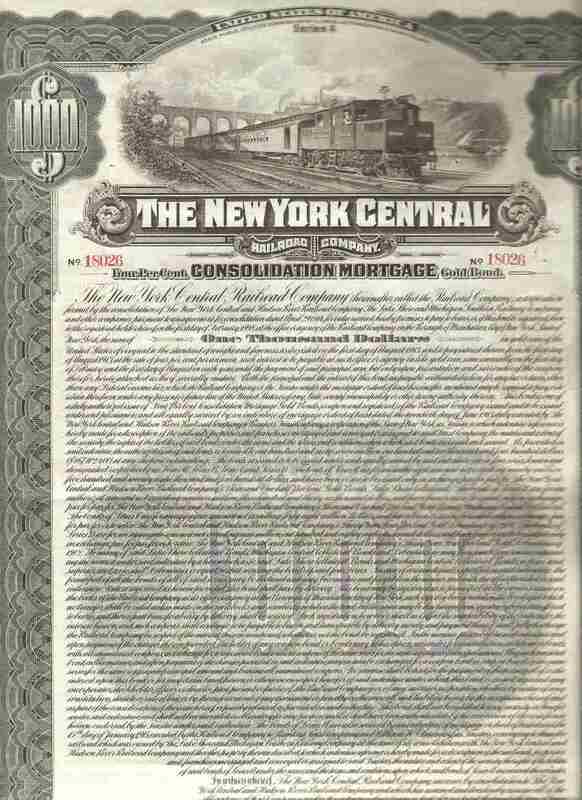 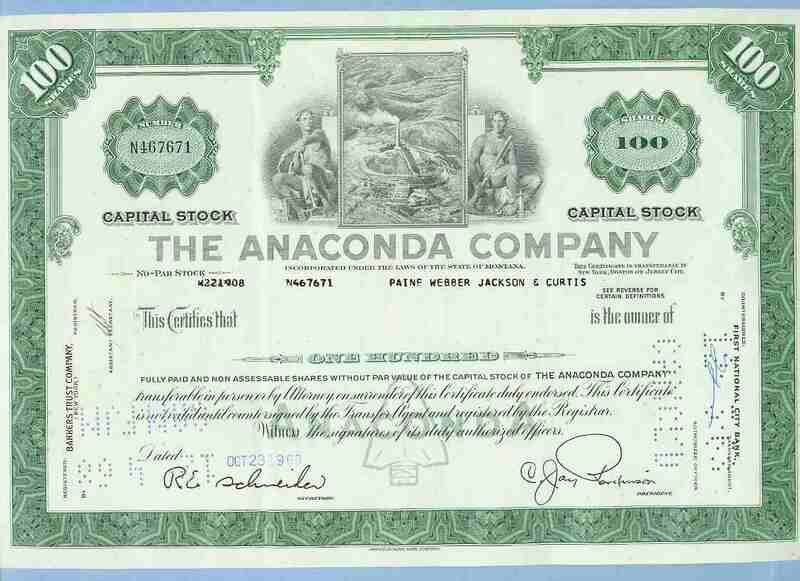 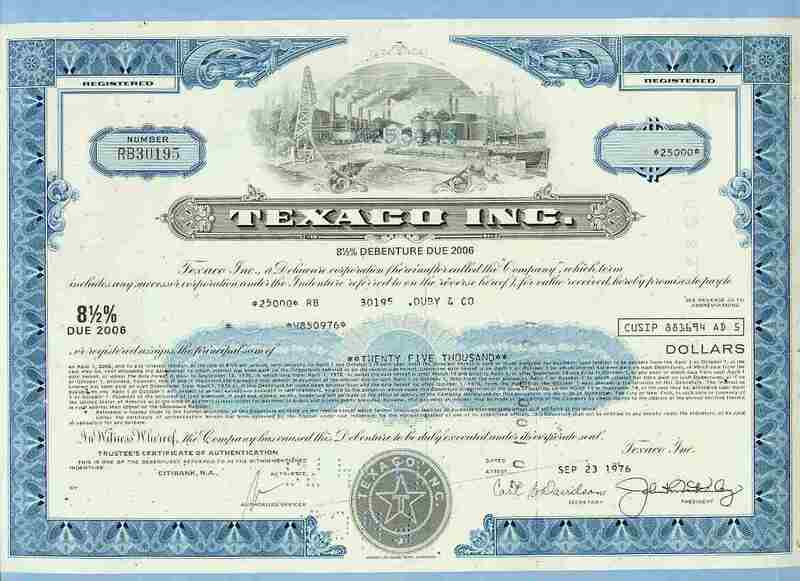 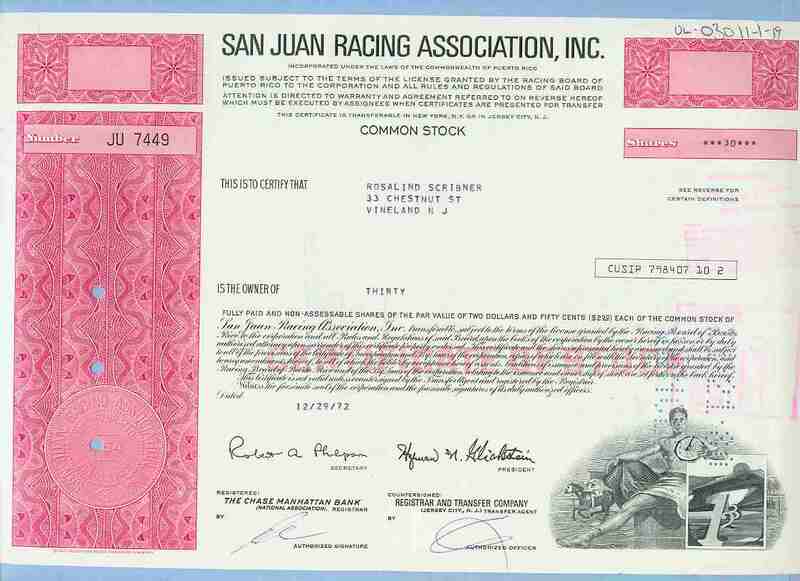 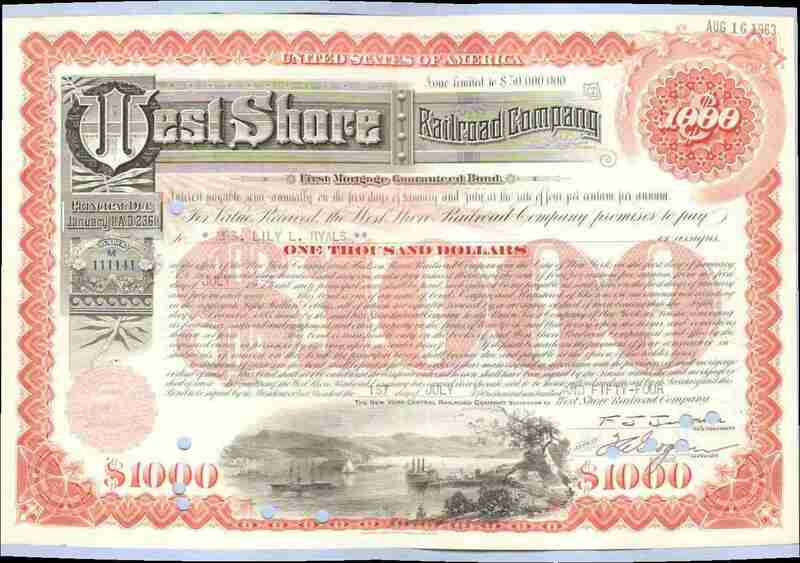 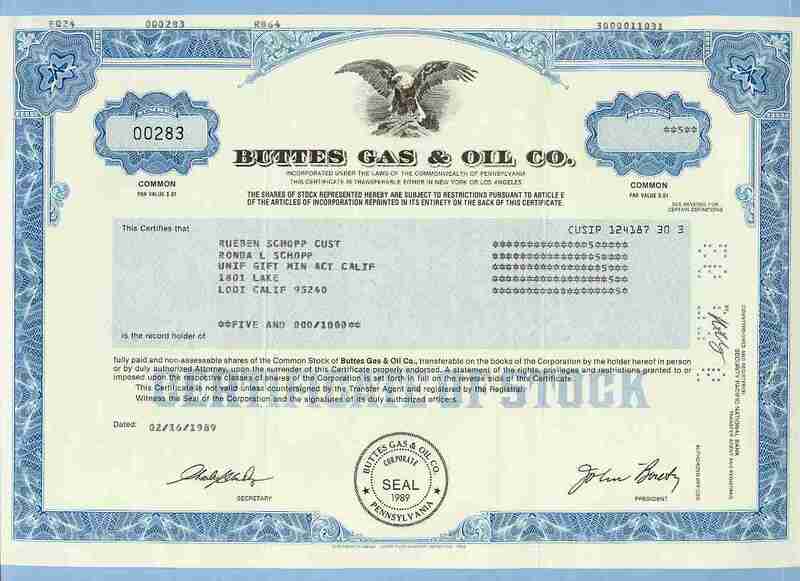 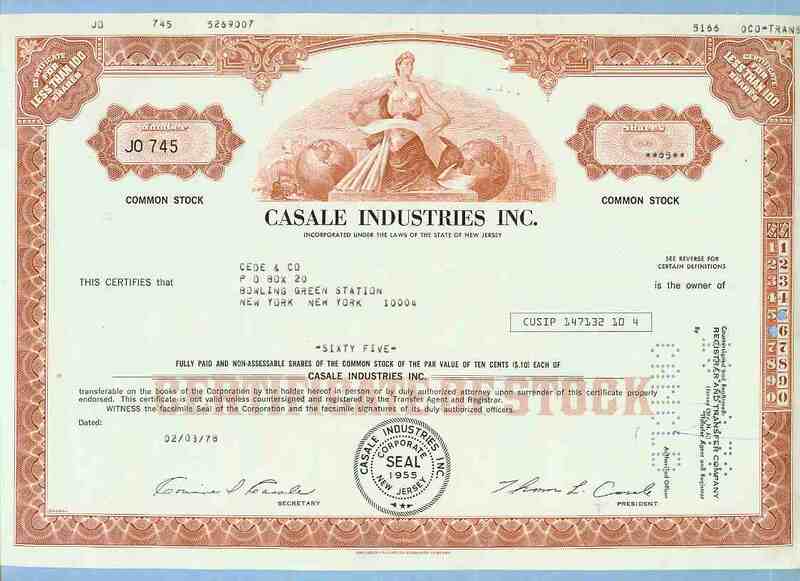 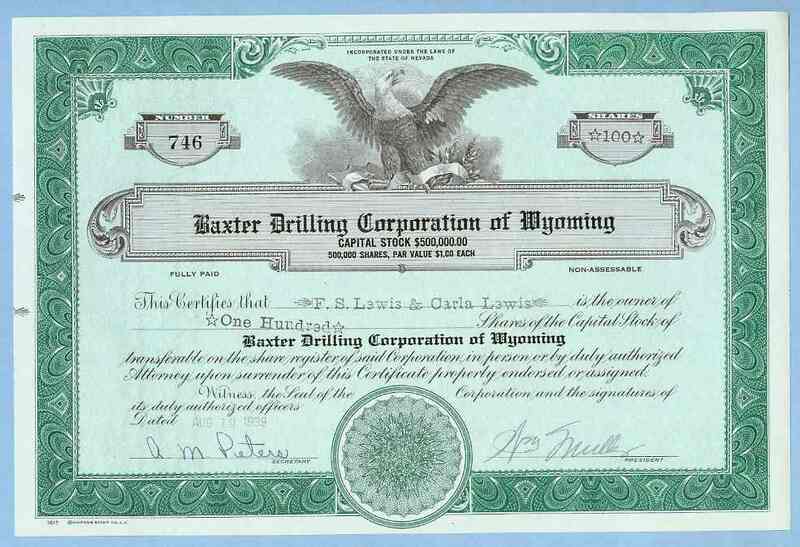 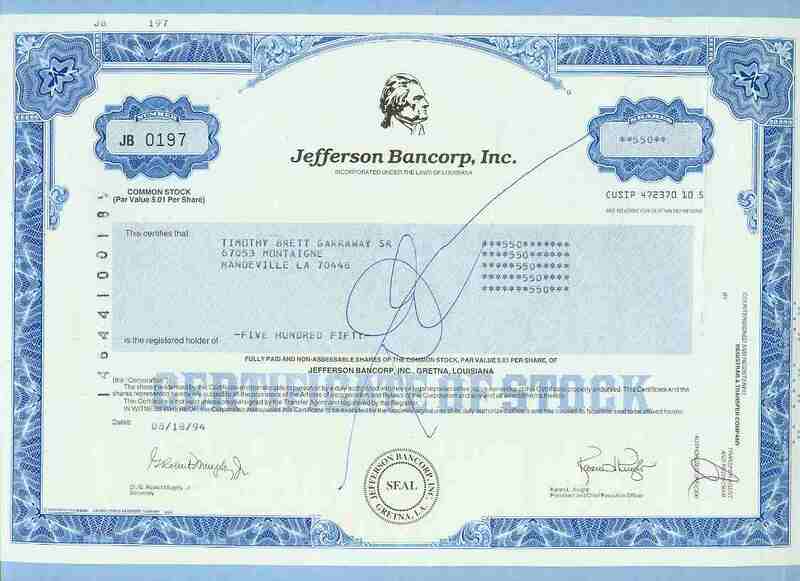 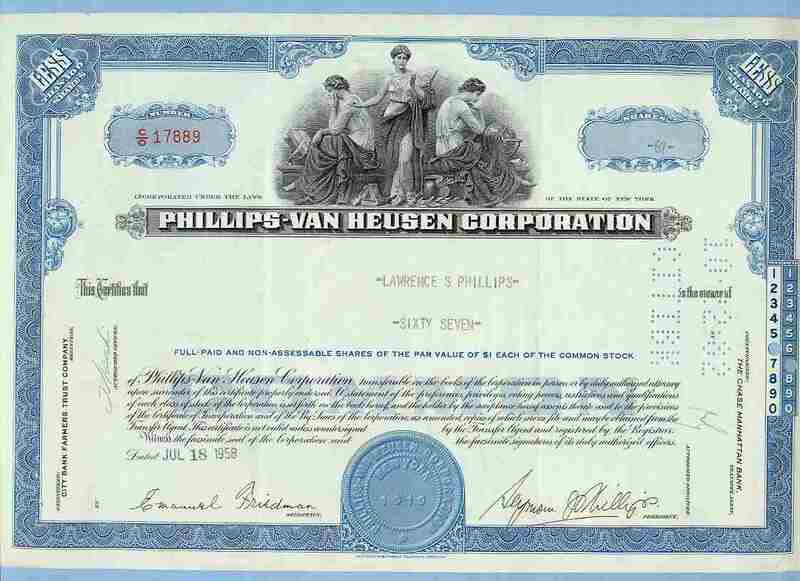 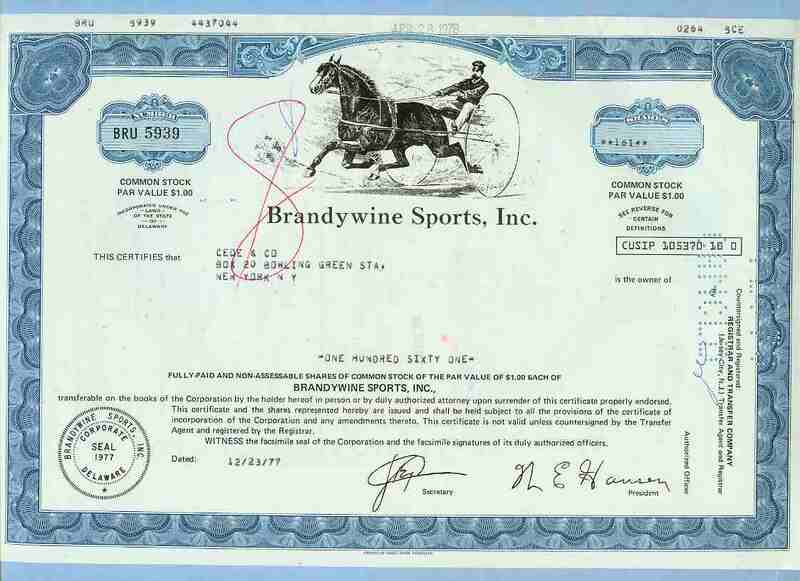 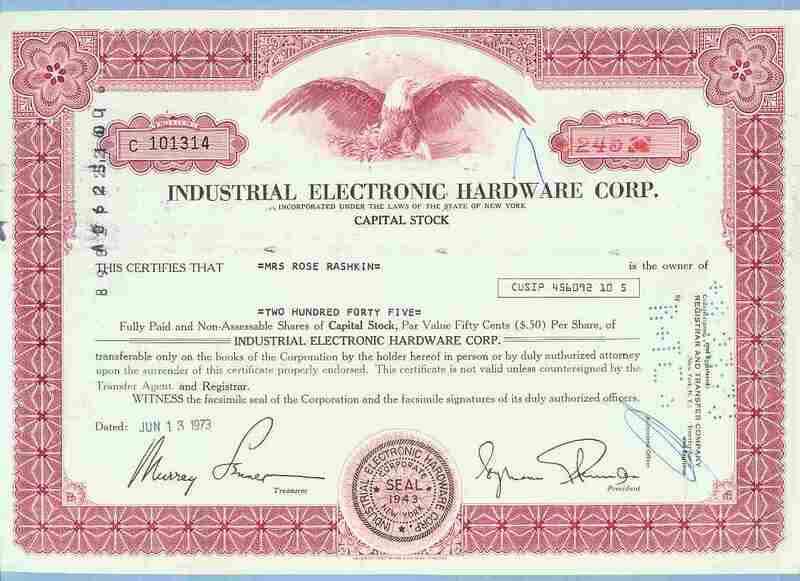 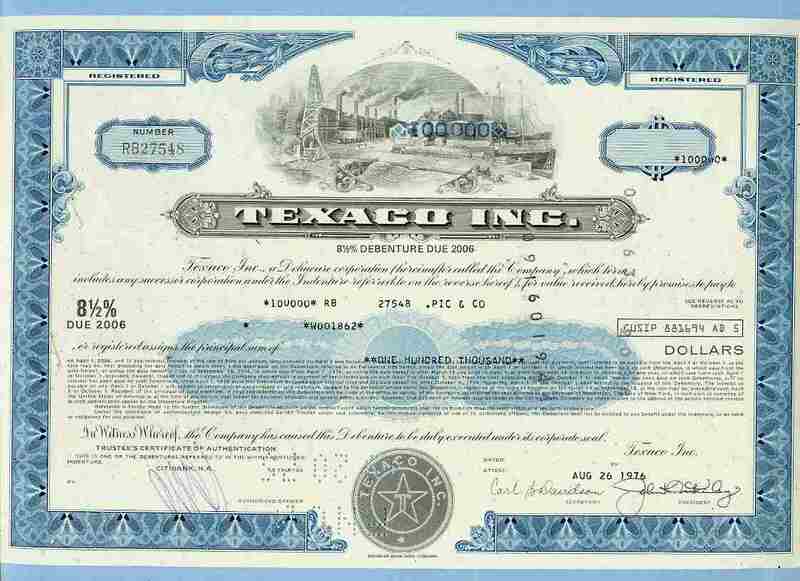 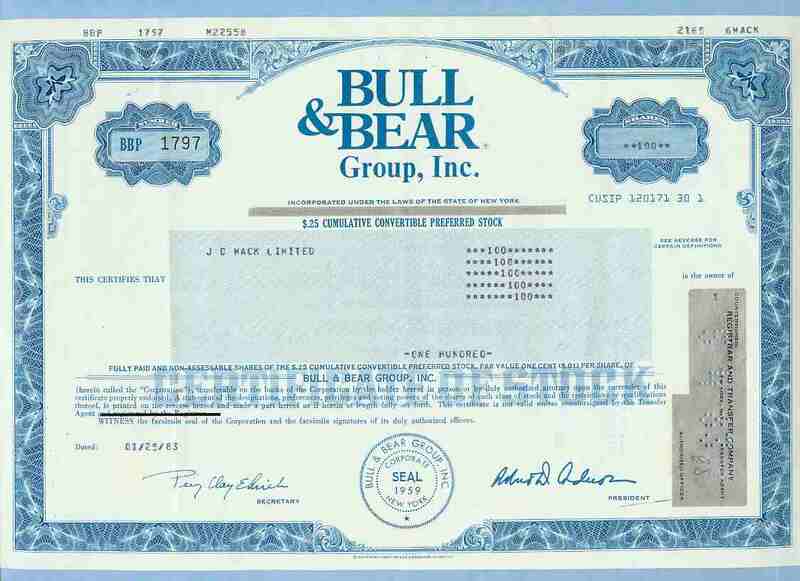 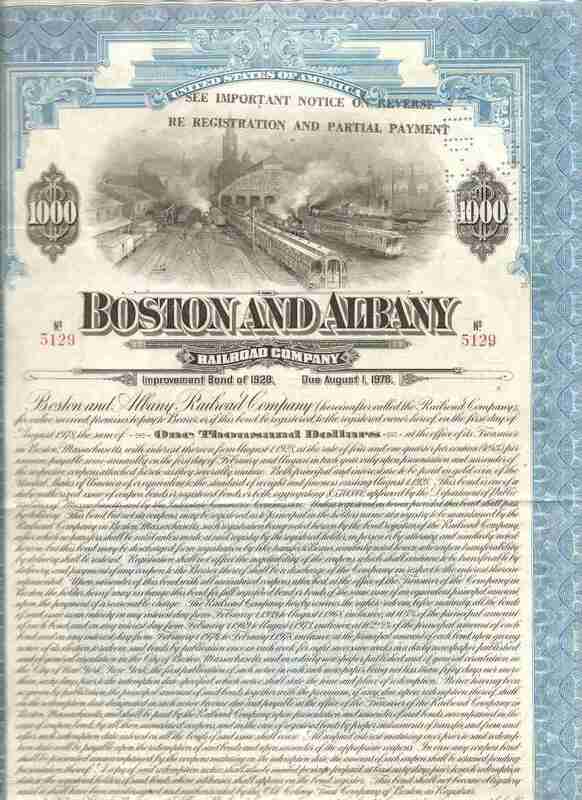 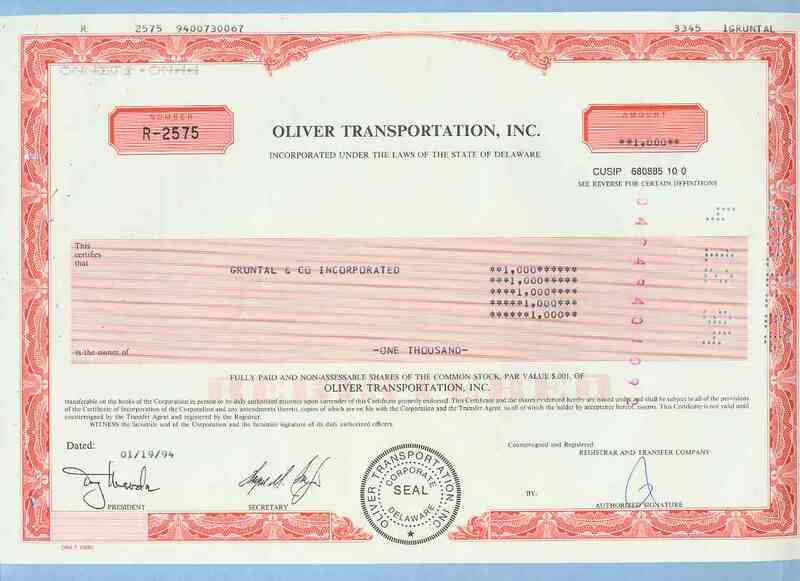 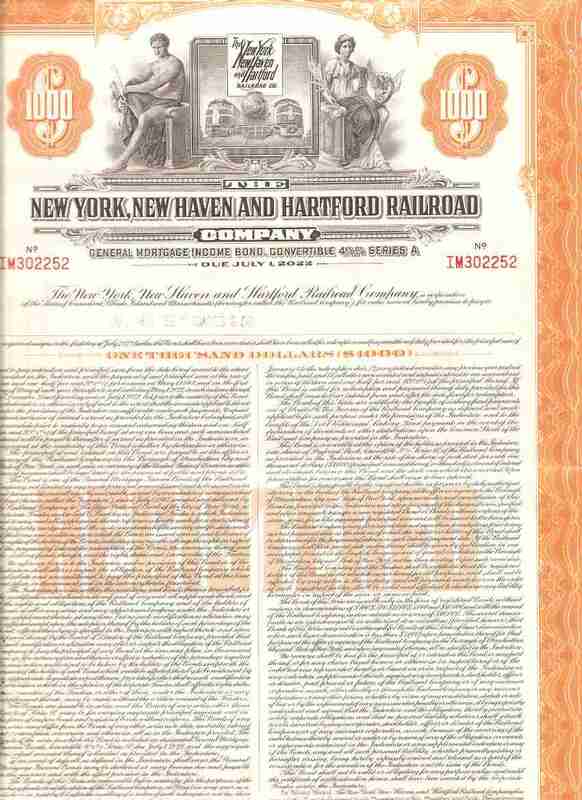 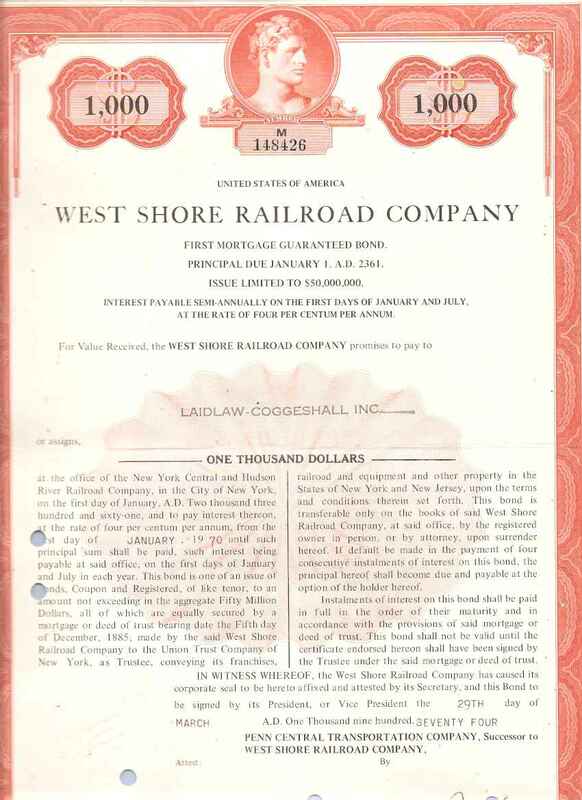 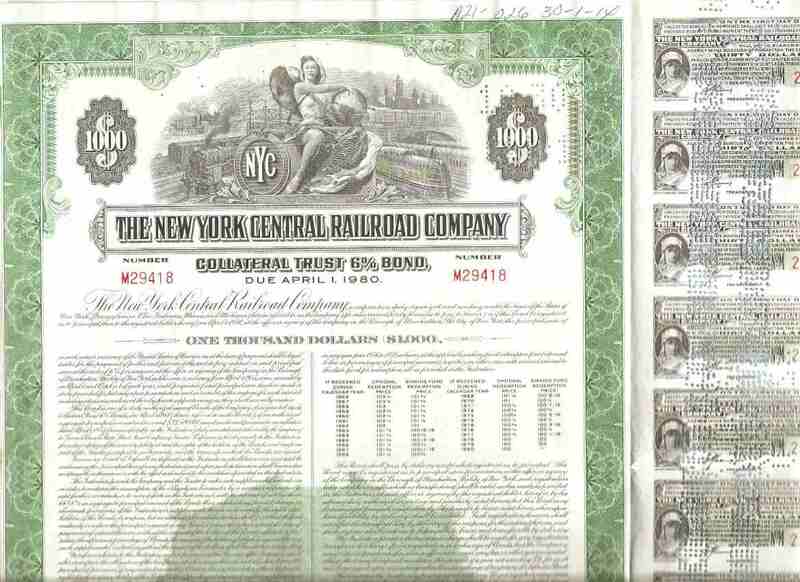 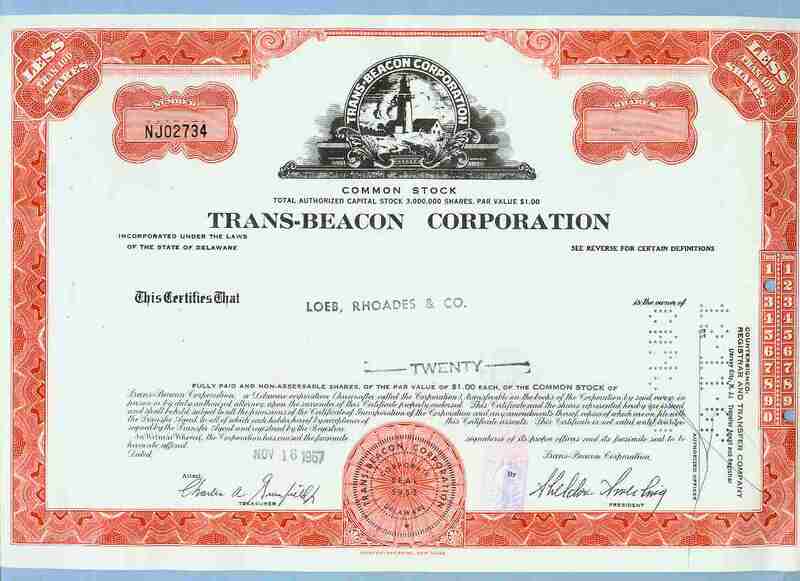 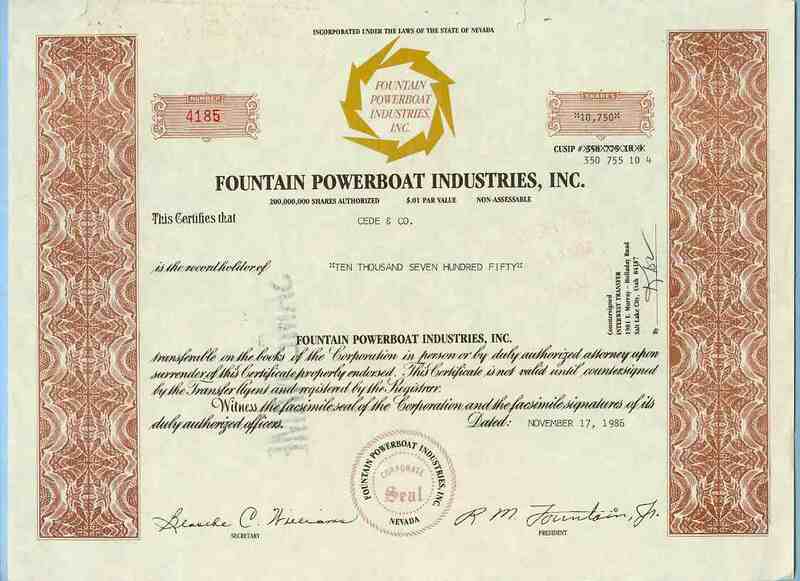 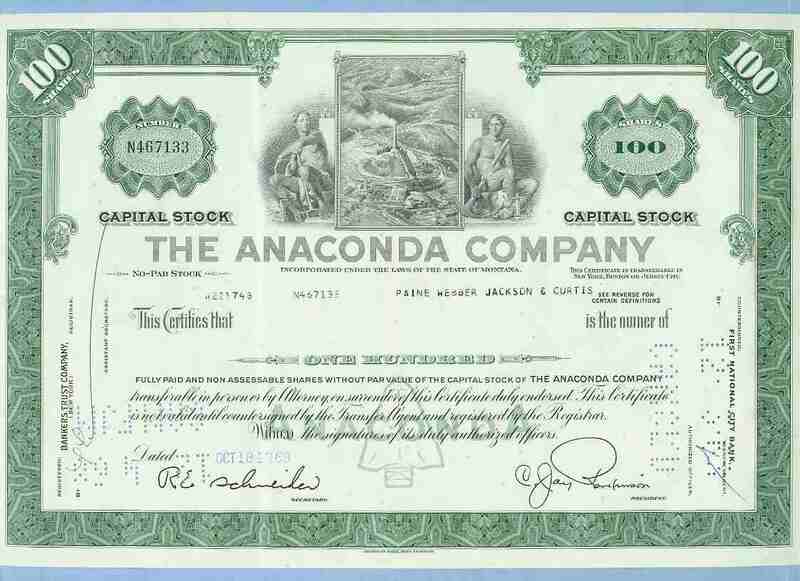 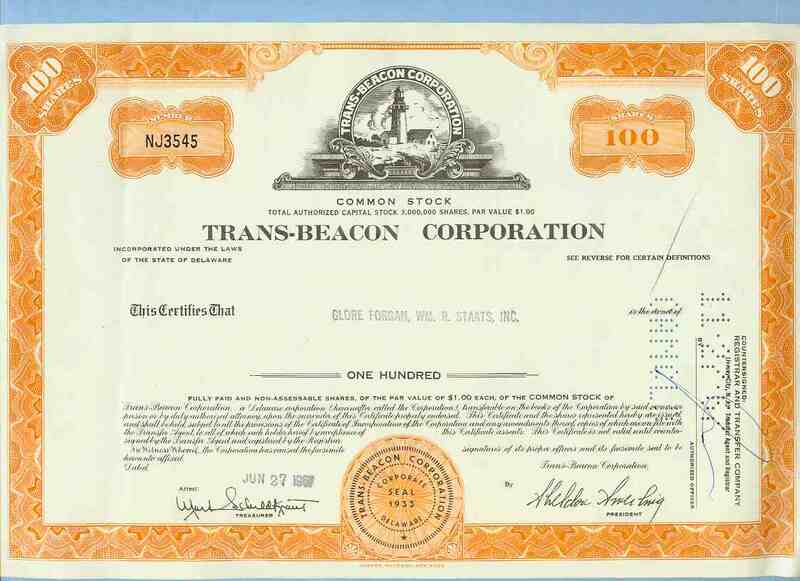 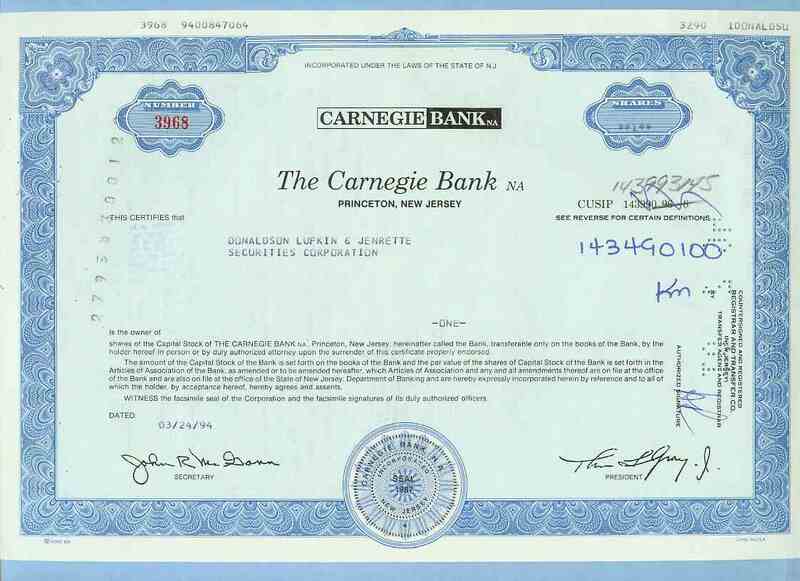 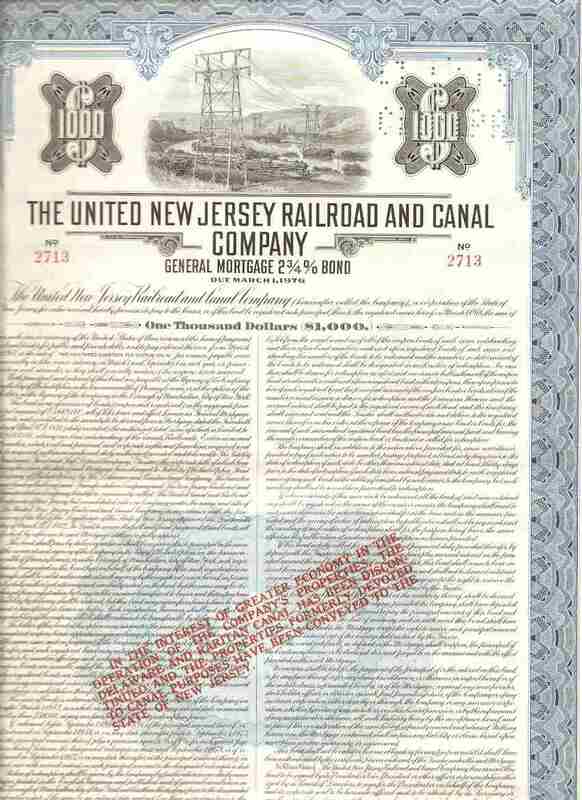 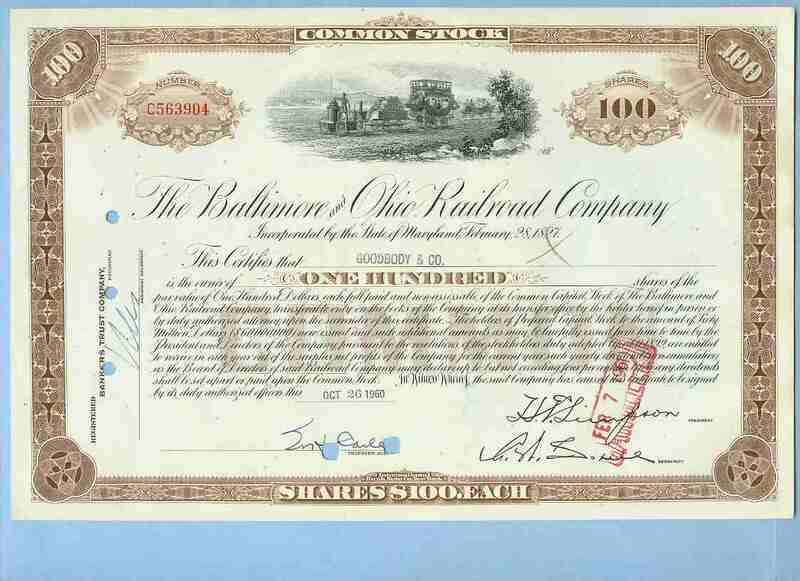 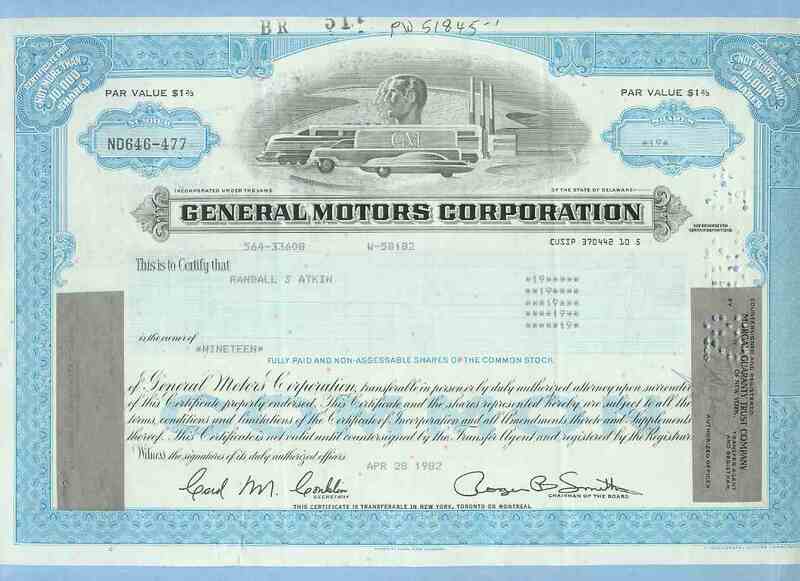 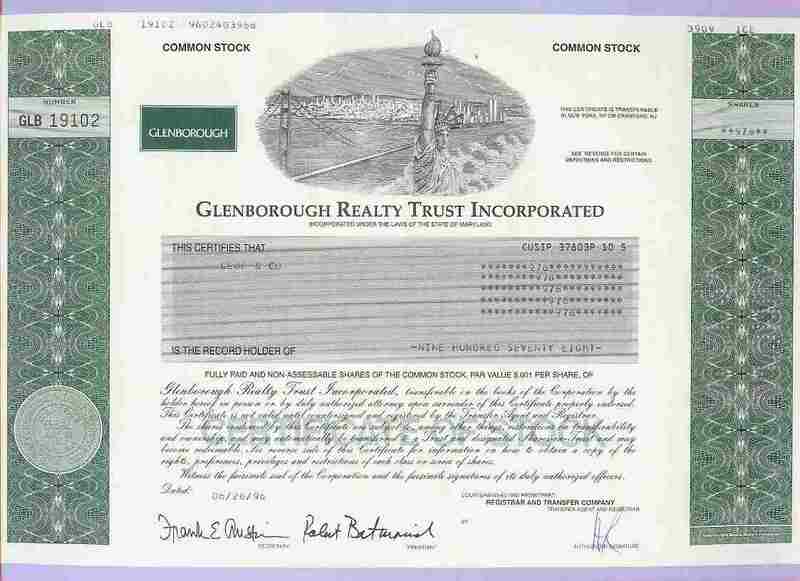 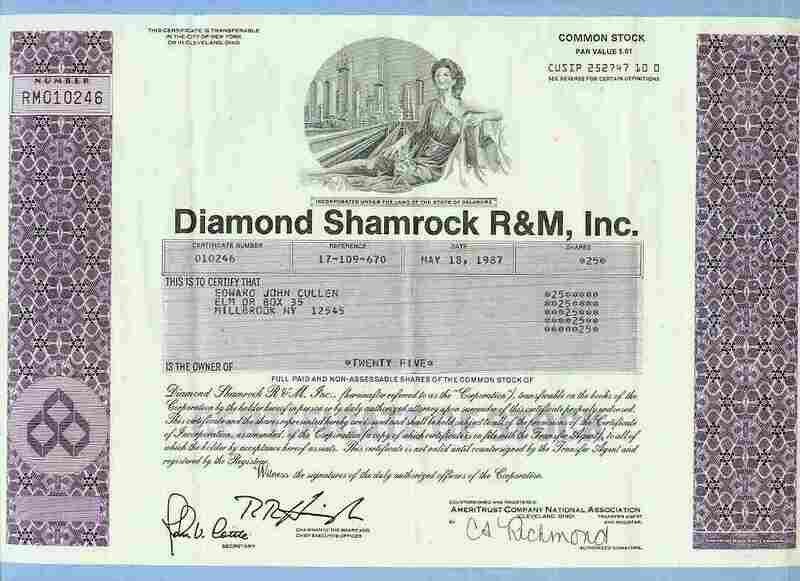 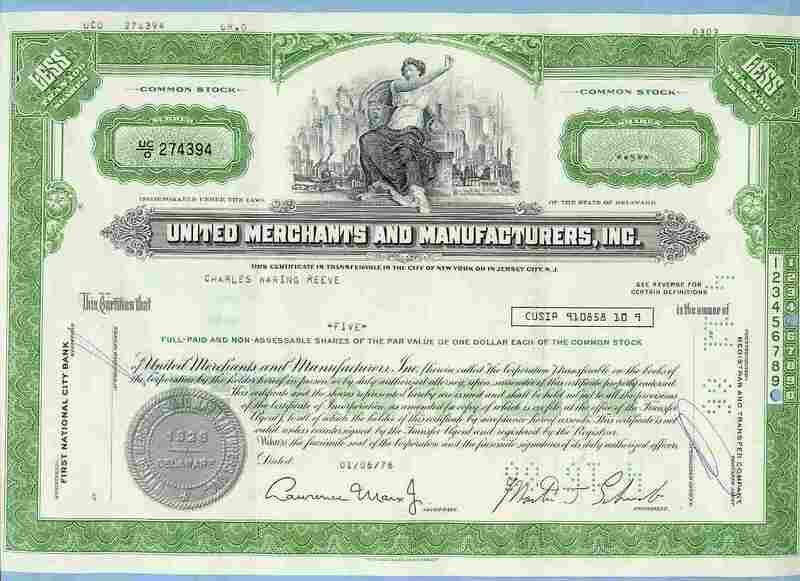 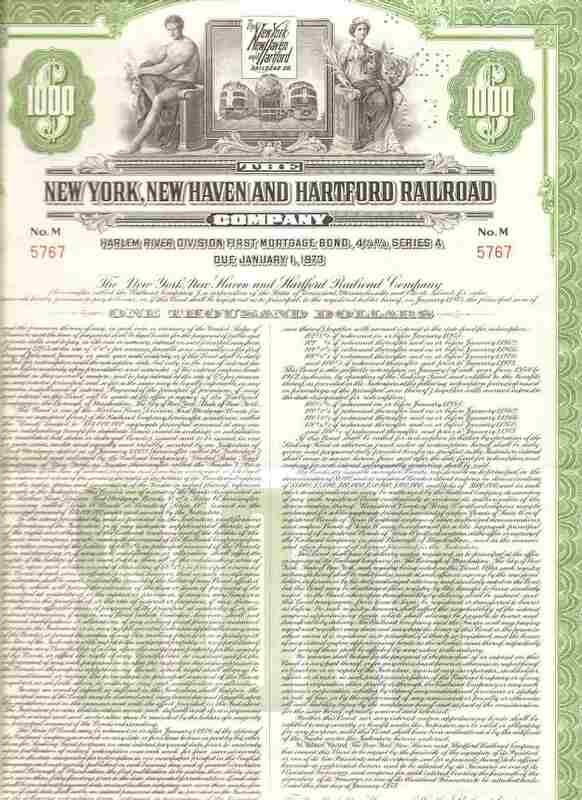 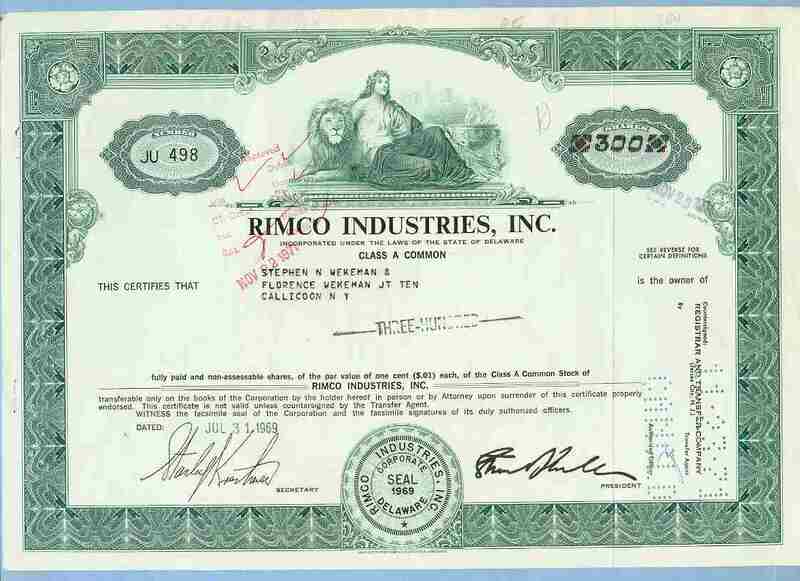 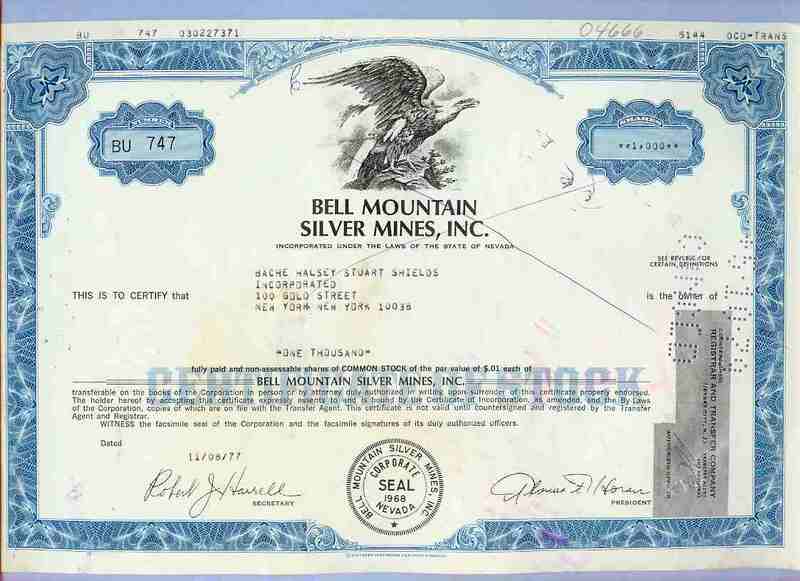 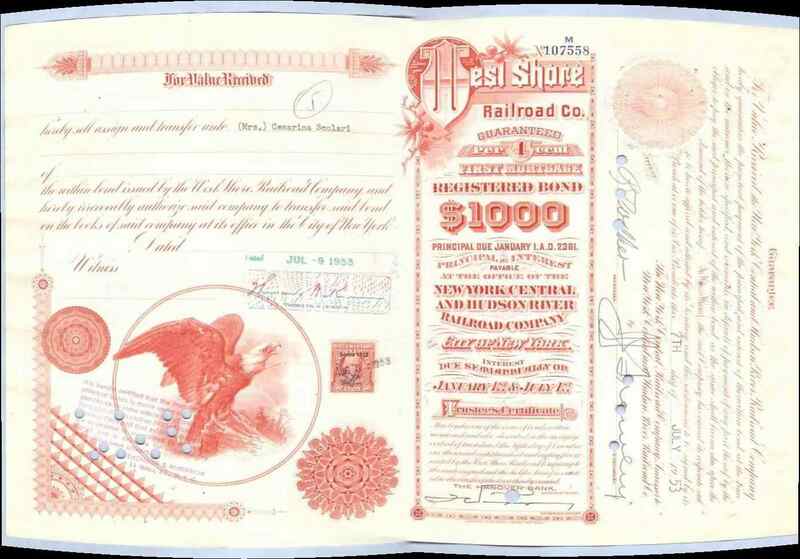 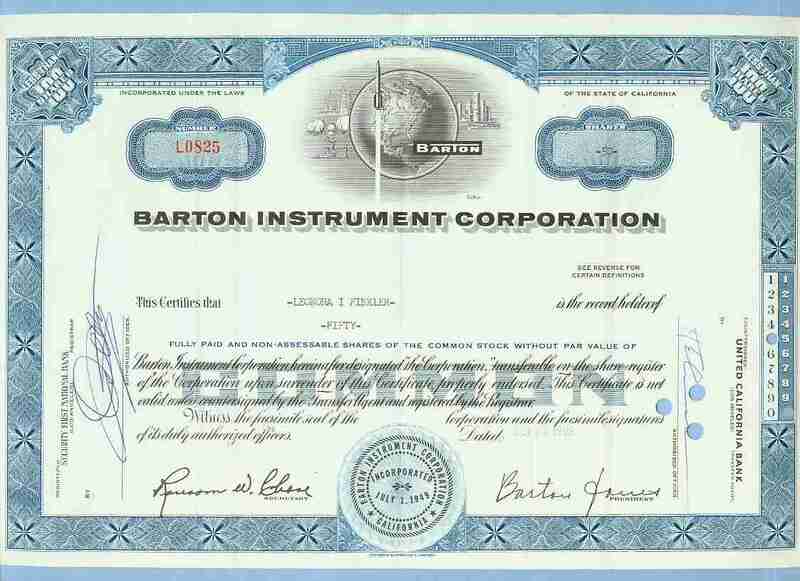 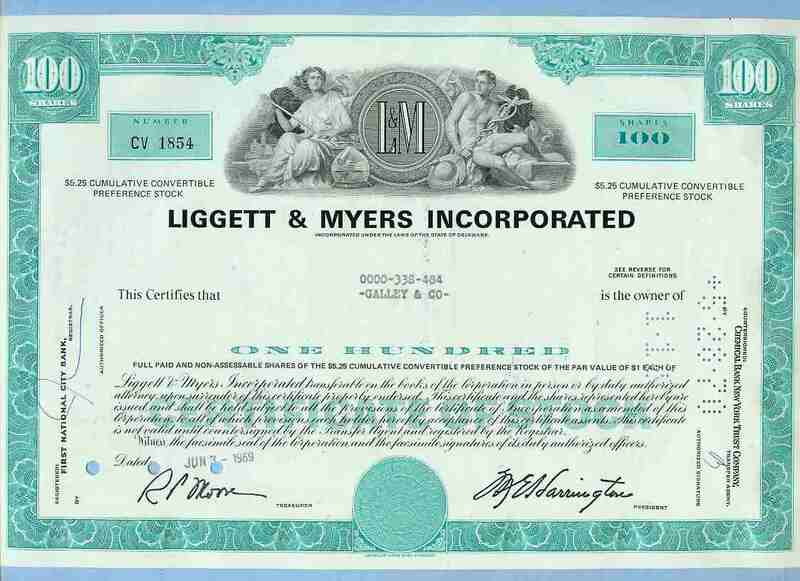 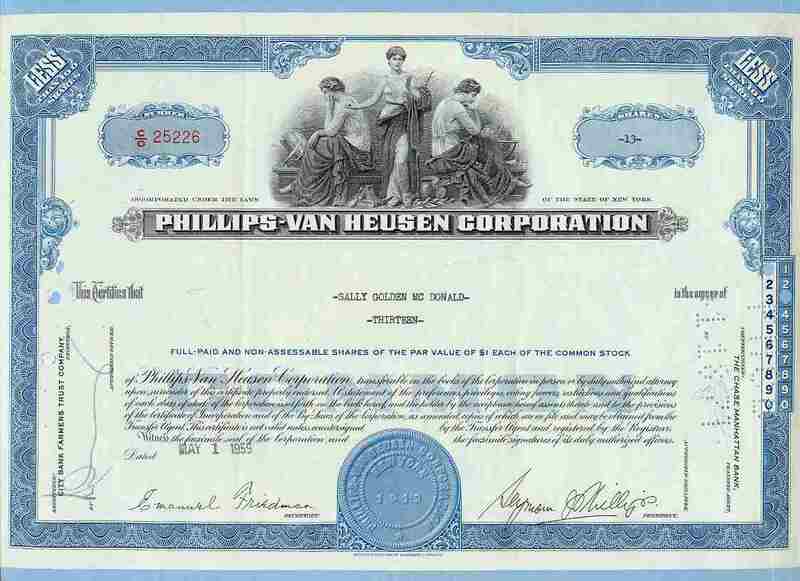 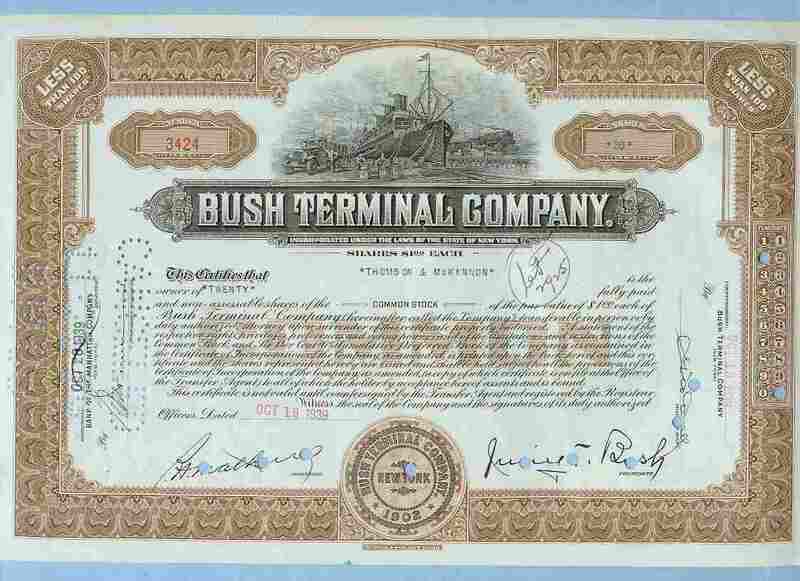 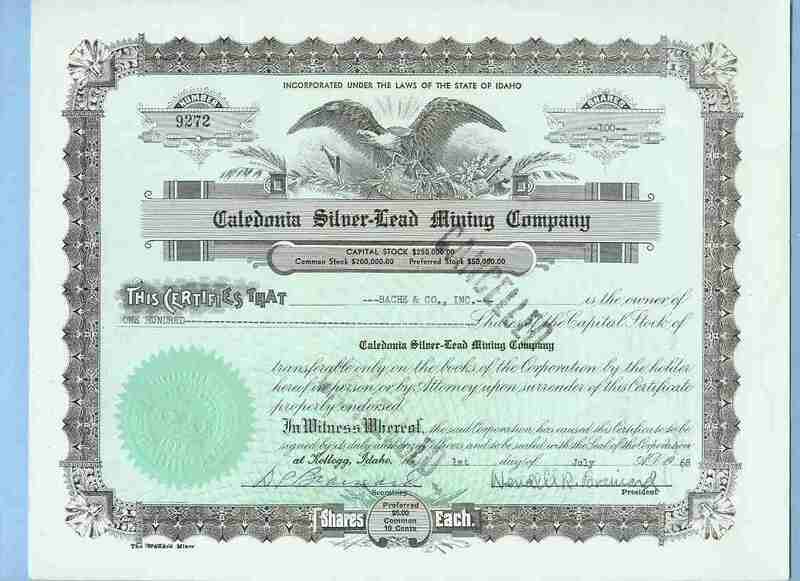 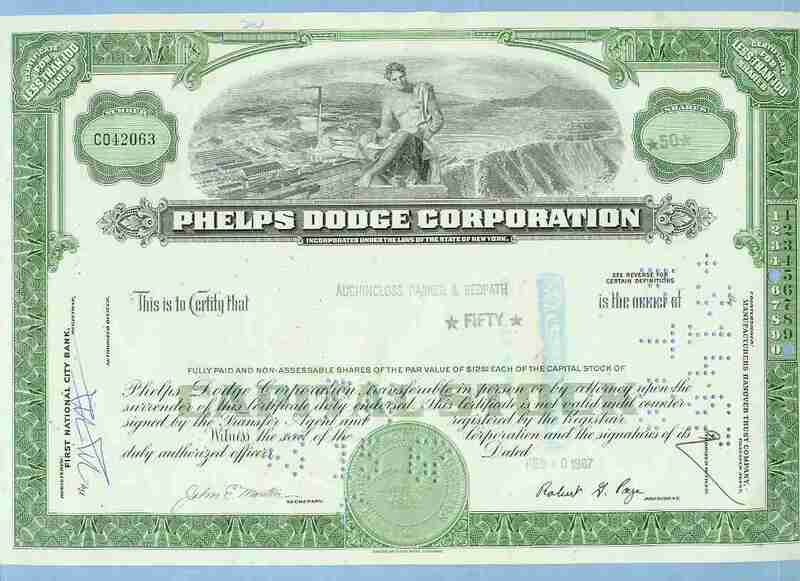 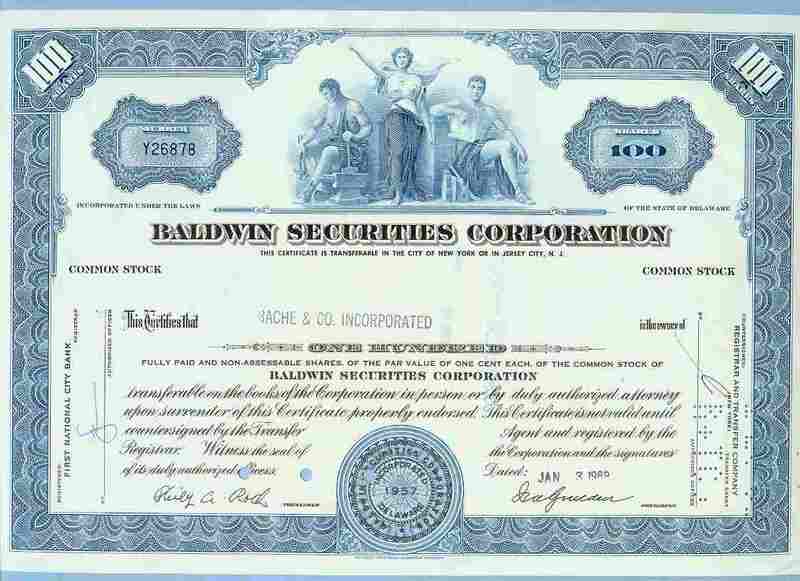 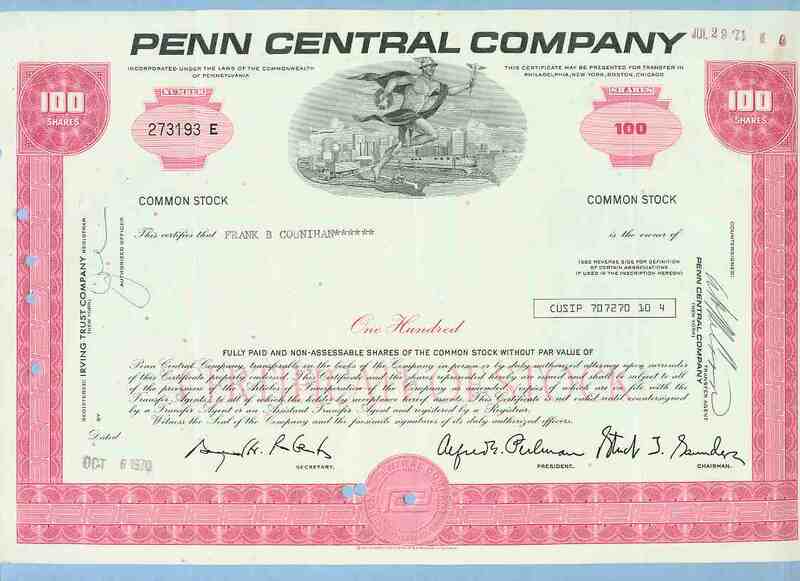 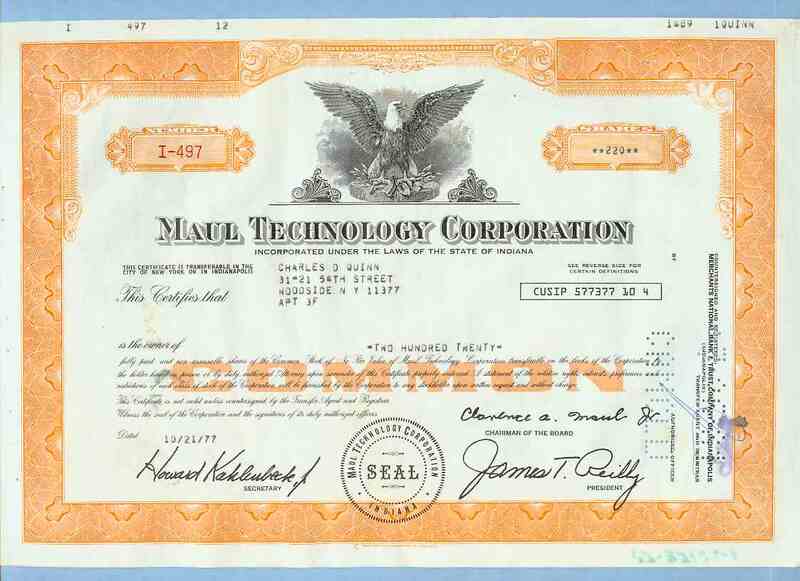 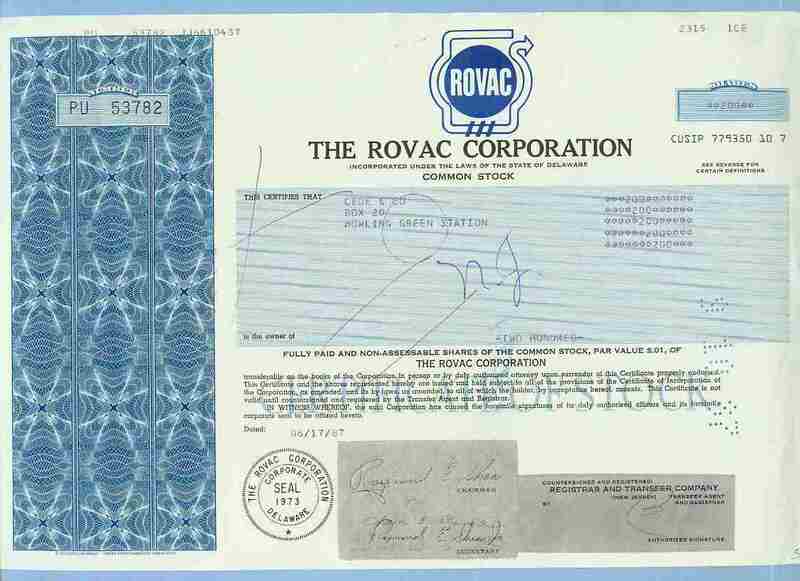 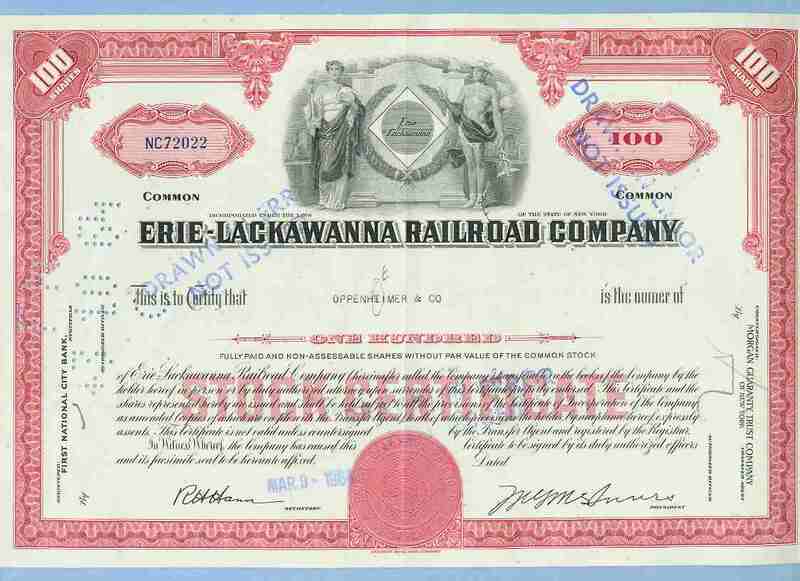 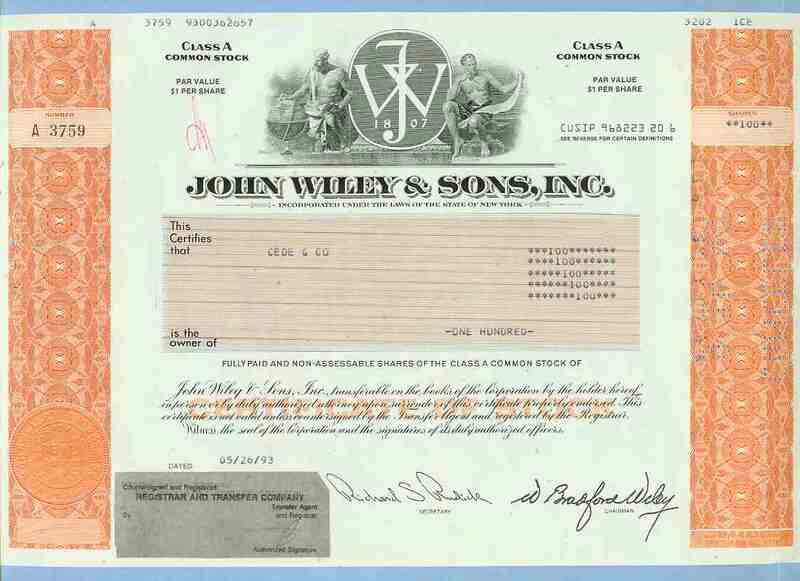 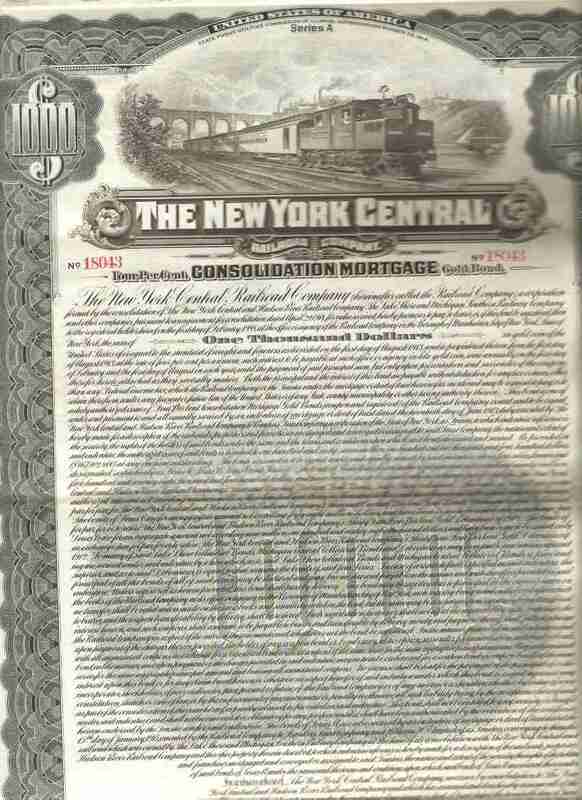 Some stock certificates are excellent examples of engraving. 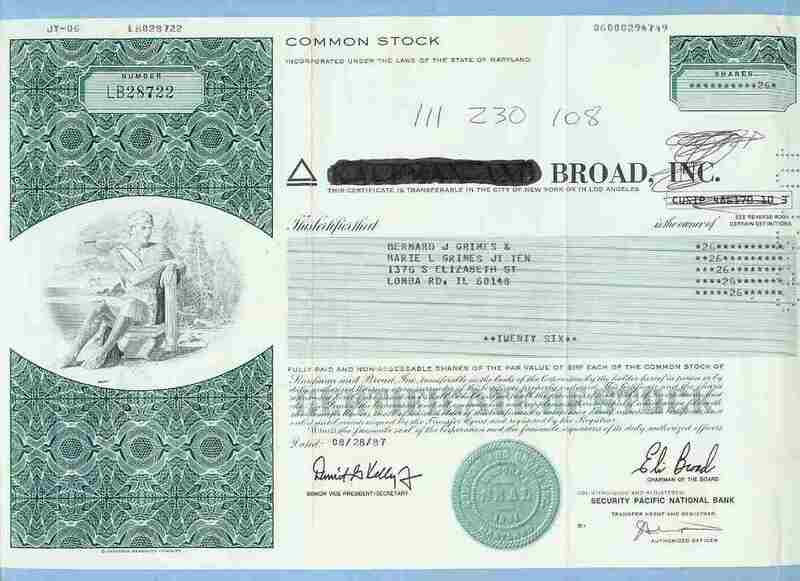 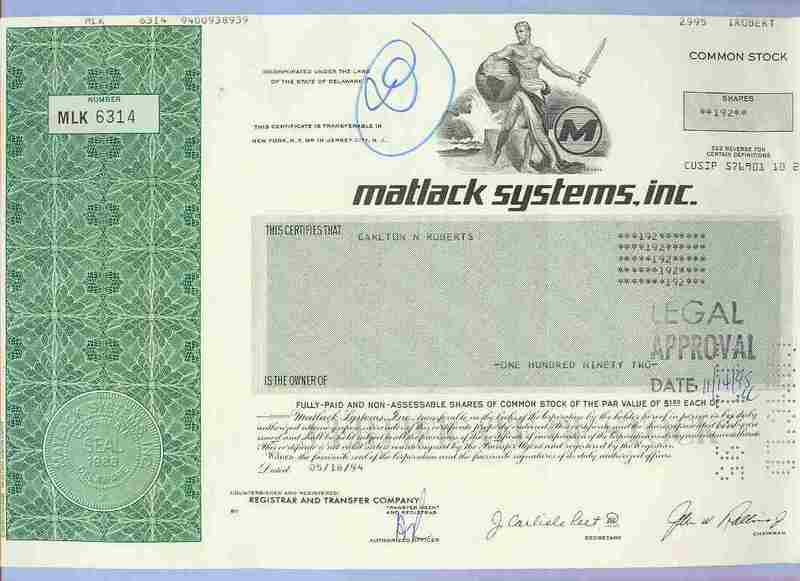 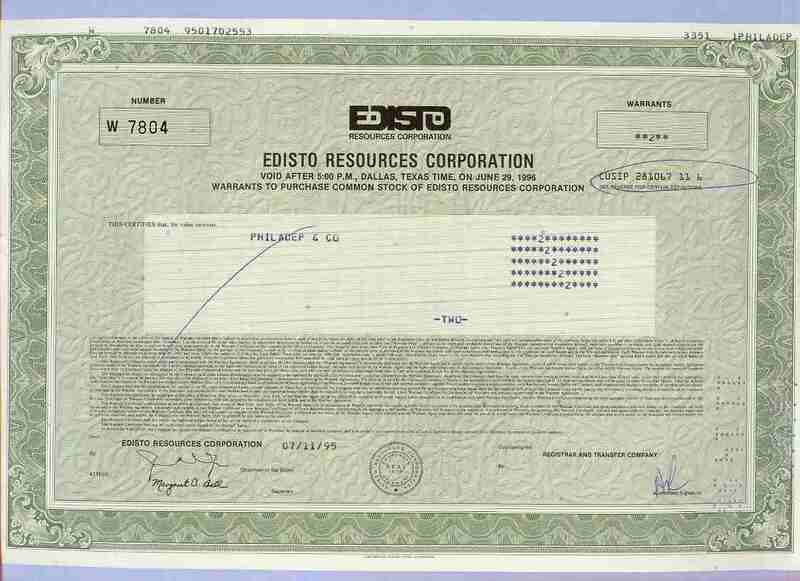 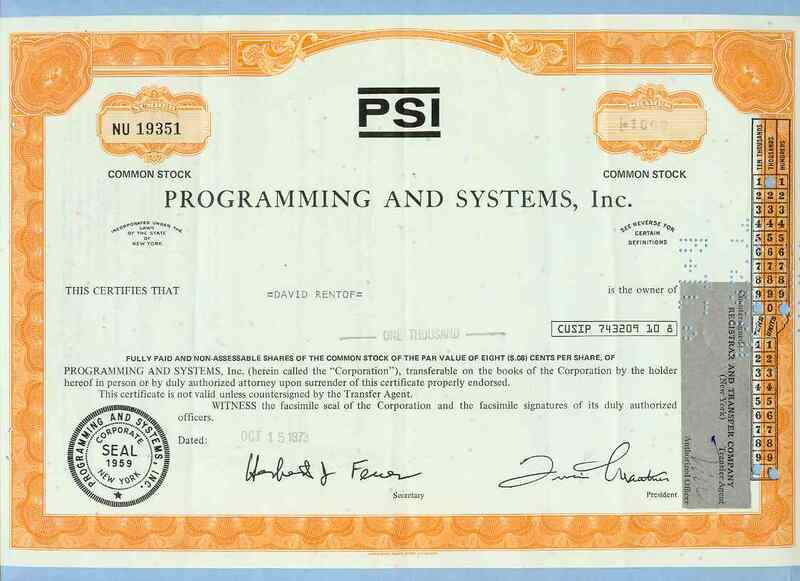 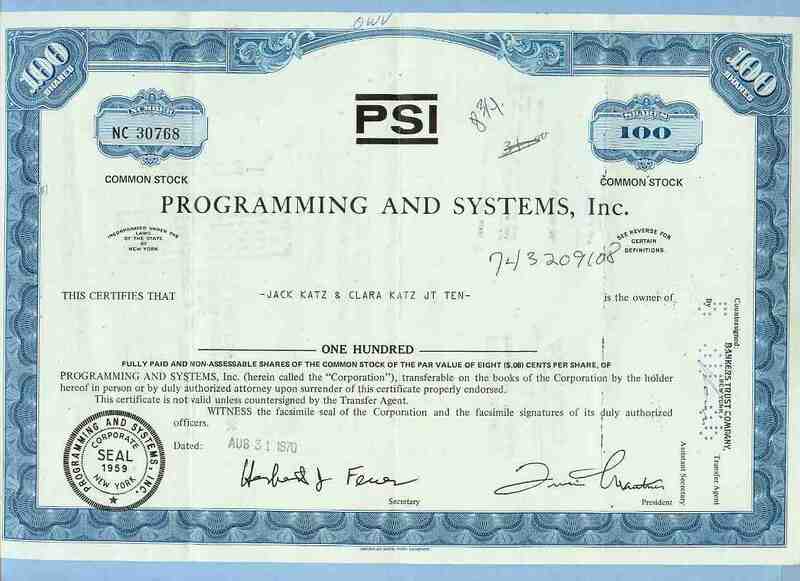 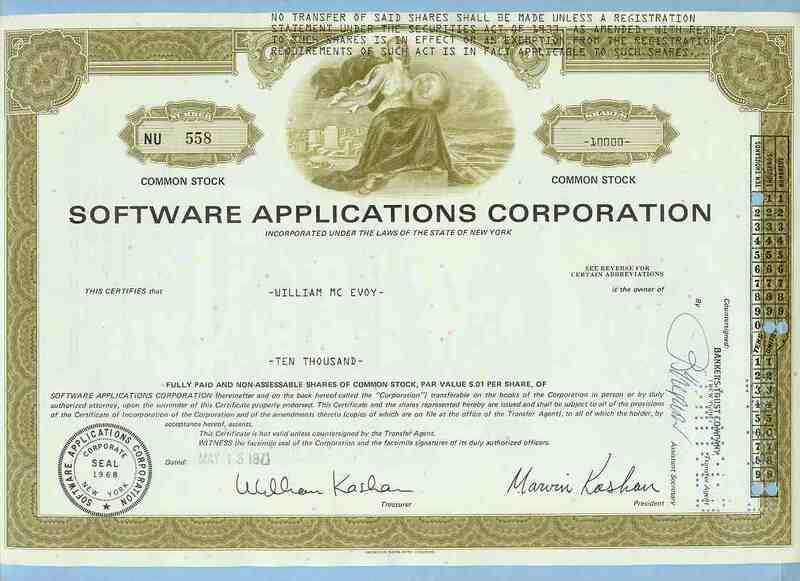 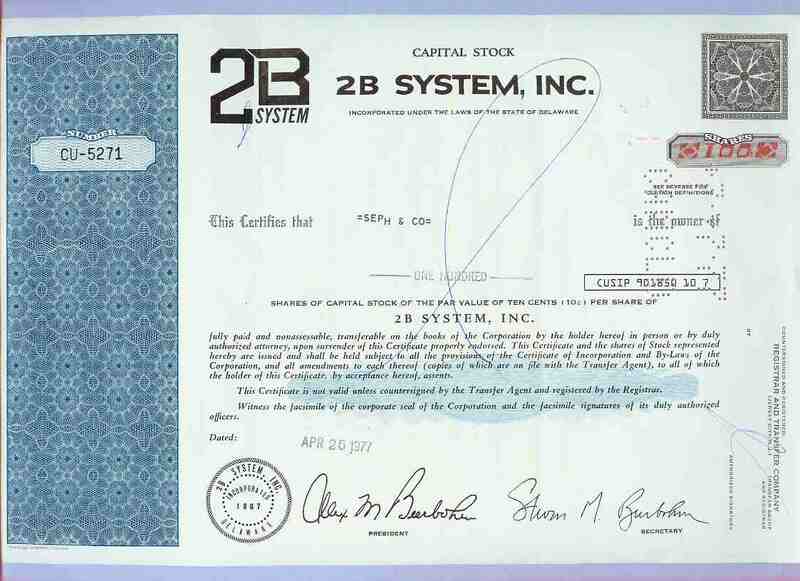 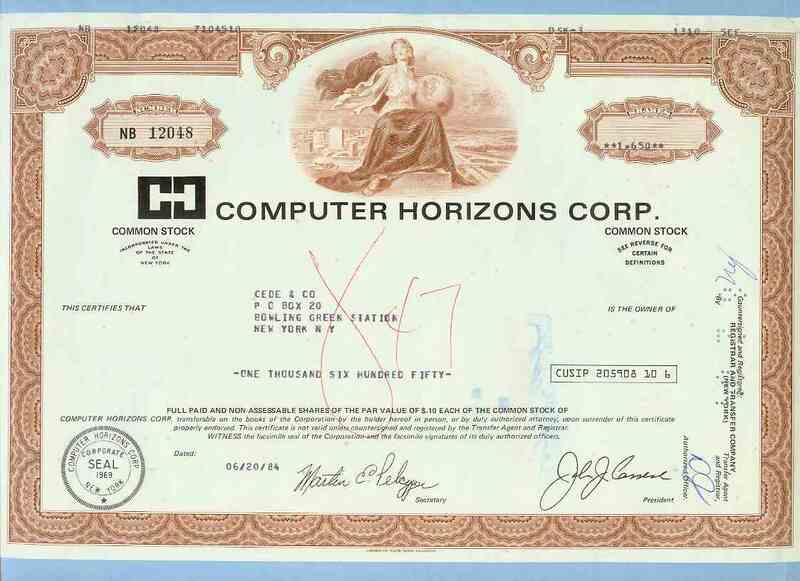 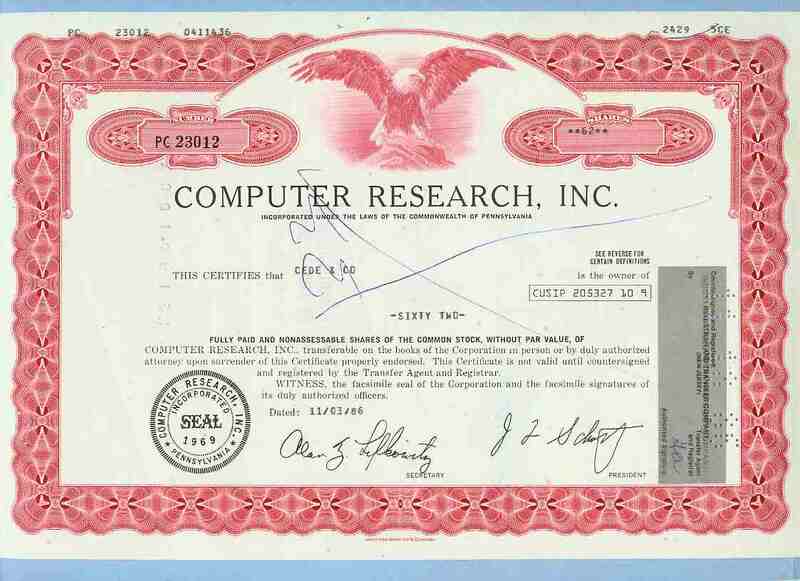 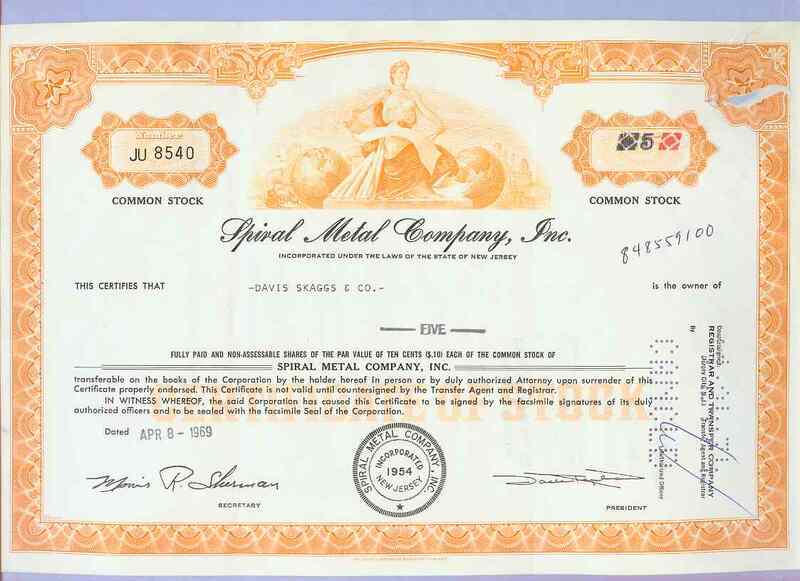 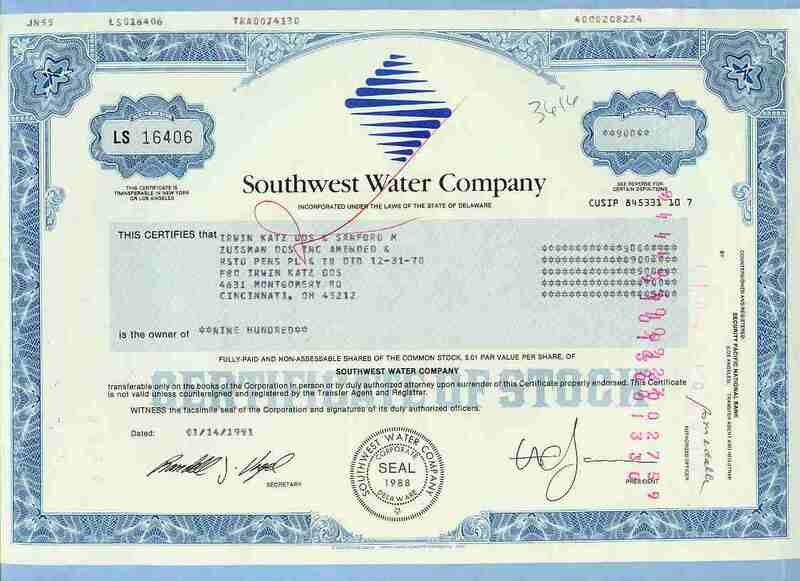 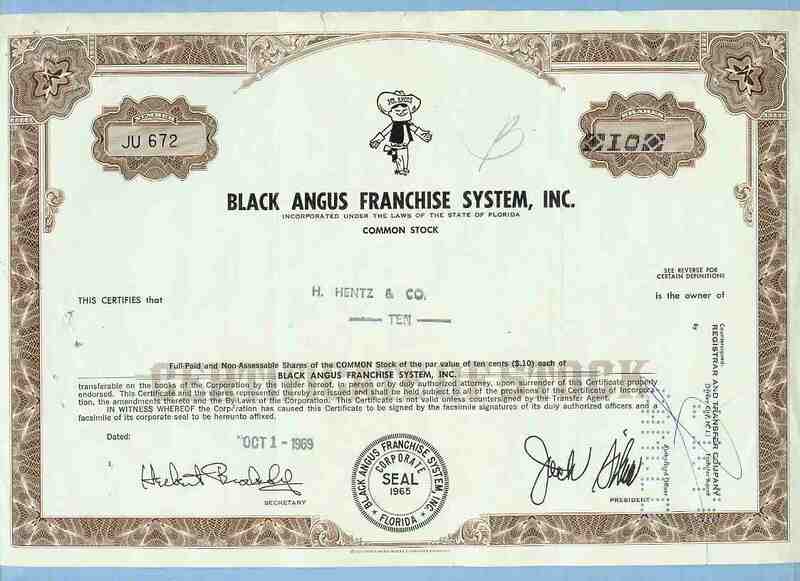 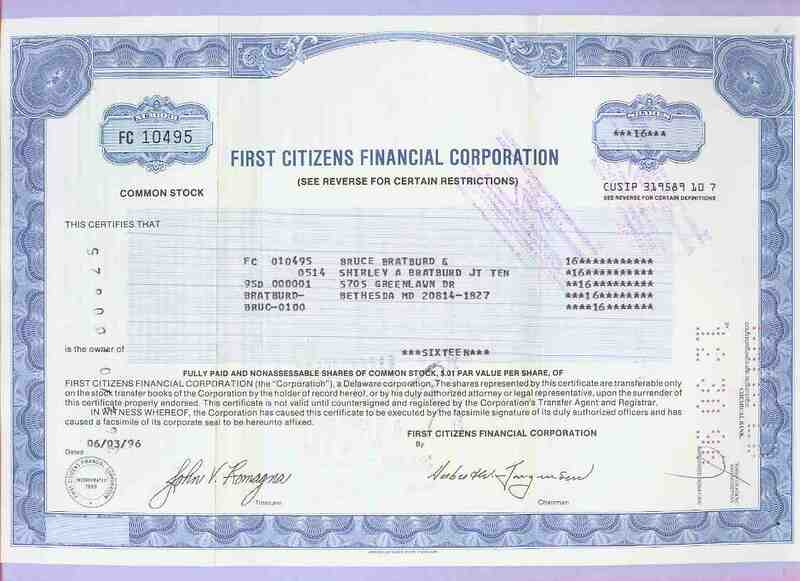 Occasionally, an old stock document will be found that still has value as a stock in a successor company. 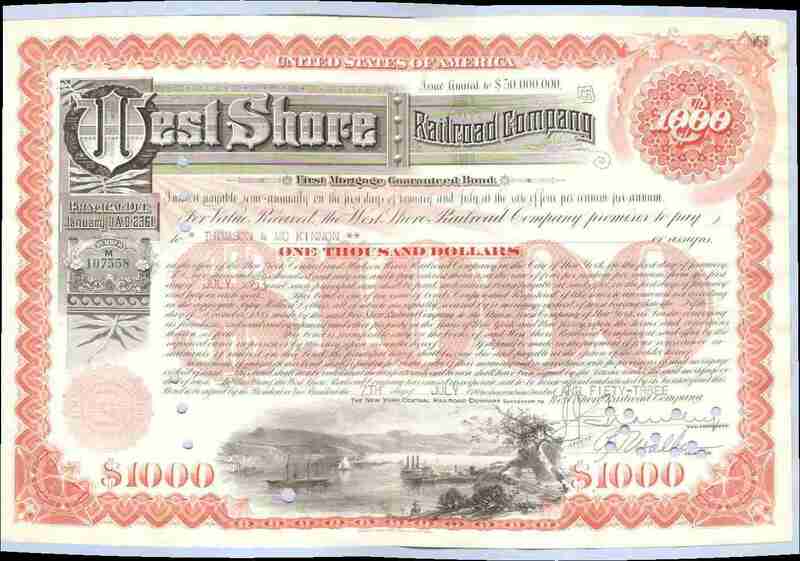 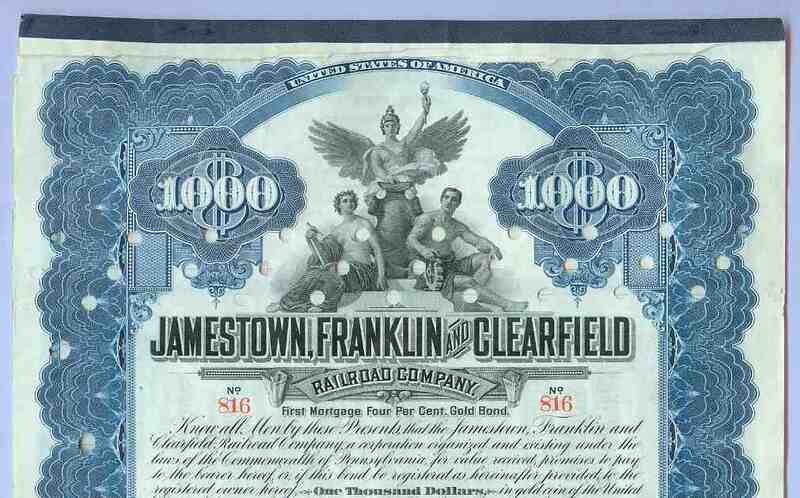 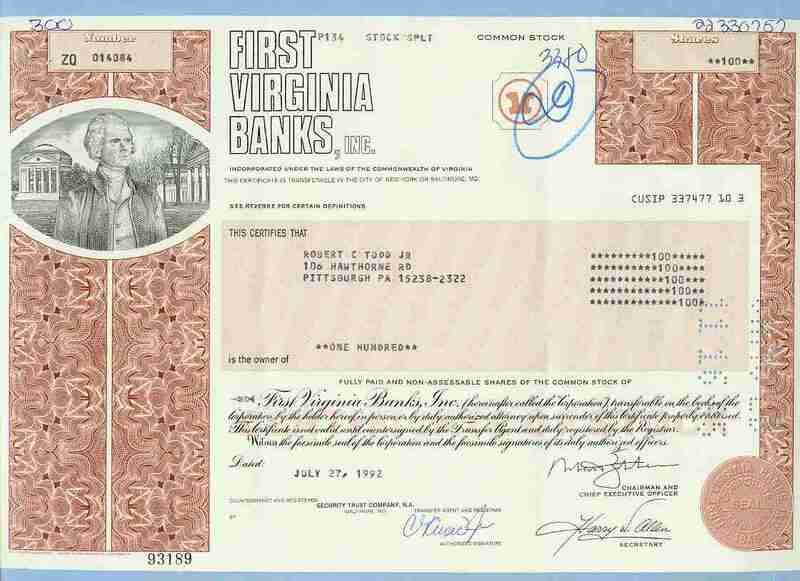 Scripophily, the collecting of canceled old stocks and bonds, gained recognition as a hobby around 1970. 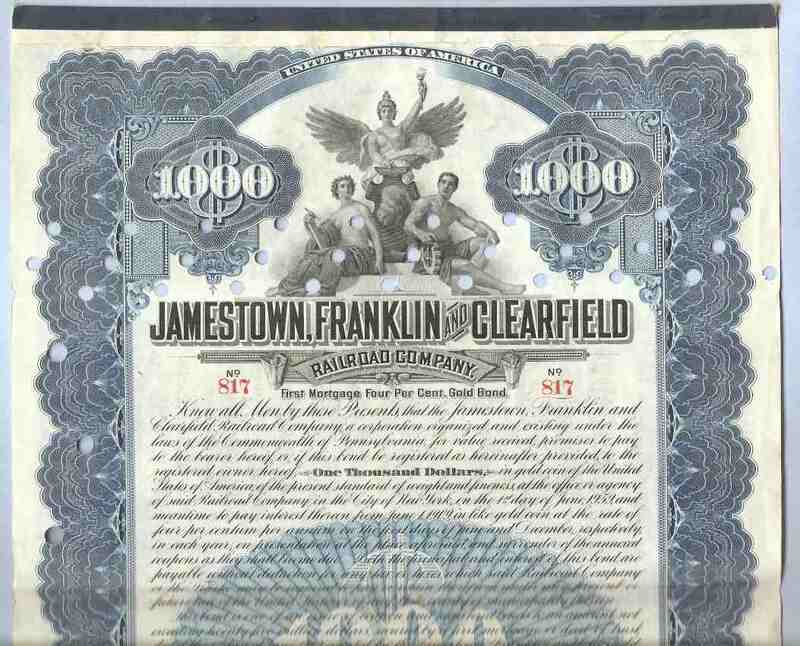 The word "scripophily" was coined by combining words from English and Greek. 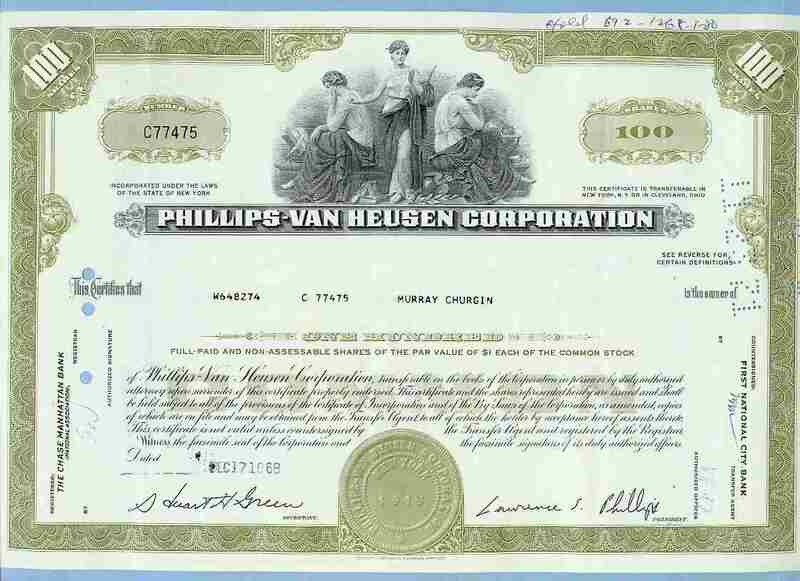 The word "scrip" represents an ownership right and the word "philos" means to love. 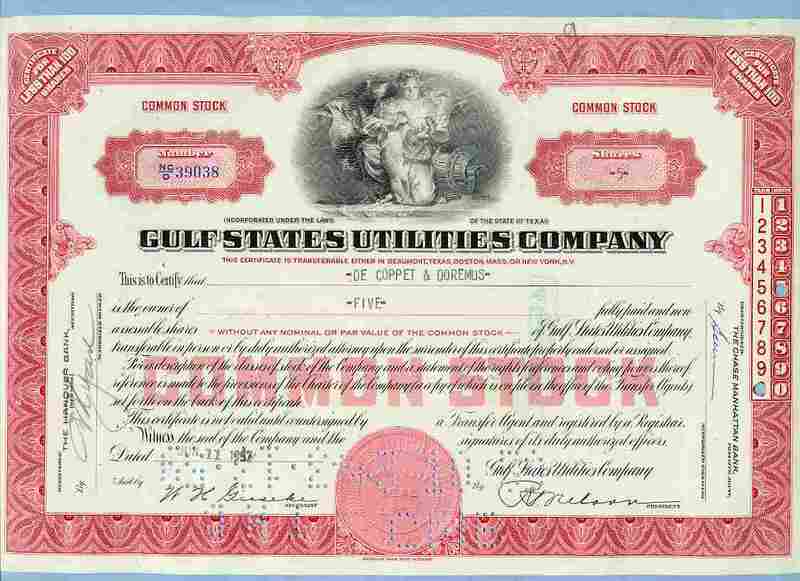 Today there are thousands of collectors worldwide (Scripophilists or Scripophiliacs) in search of scarce, rare, and popular stocks and bonds. 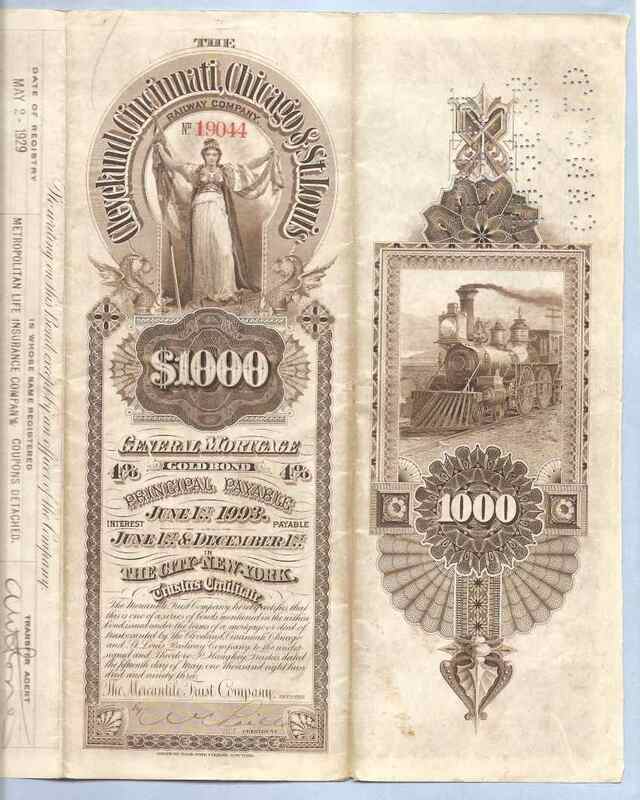 Collectors who come from a variety of businesses enjoy this as a hobby, although there are many who also consider scripophily a good investment. 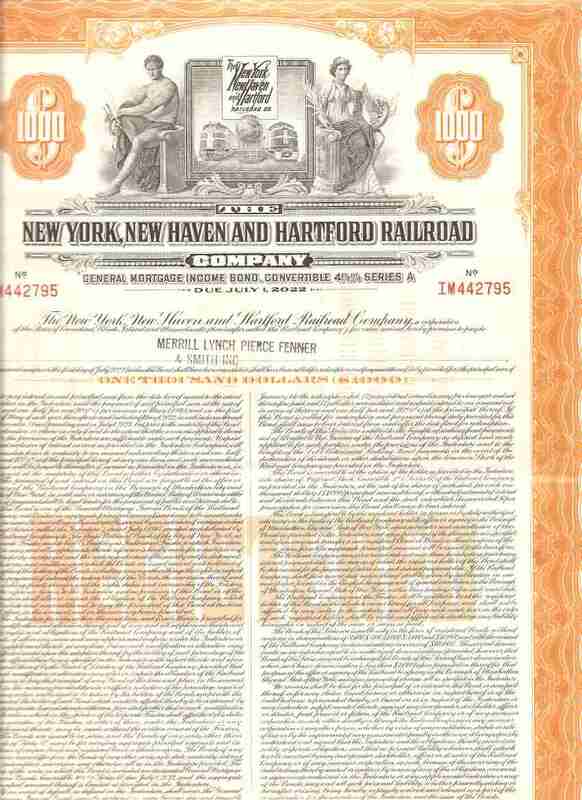 In fact, over the past several years, the hobby has exploded in popularity. 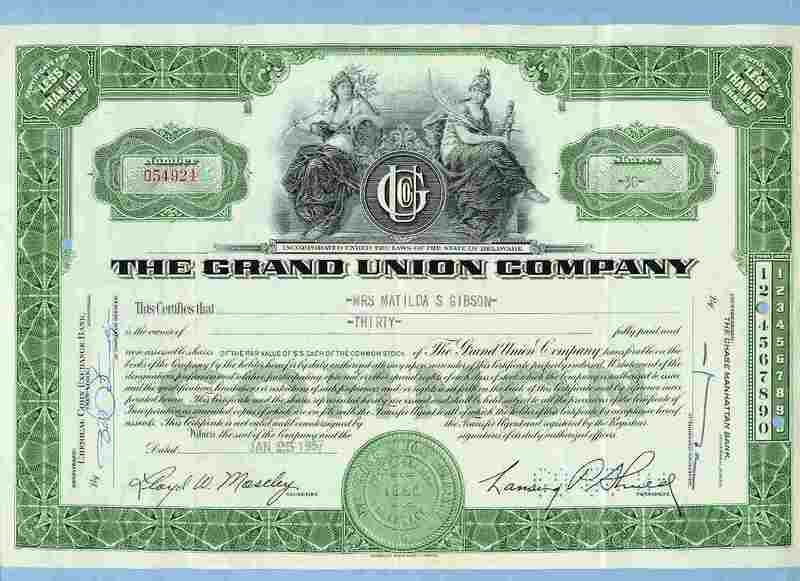 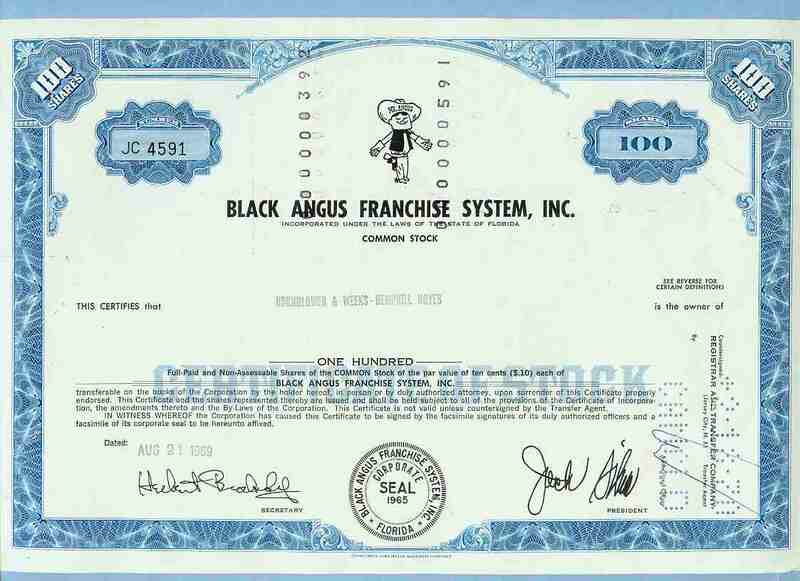 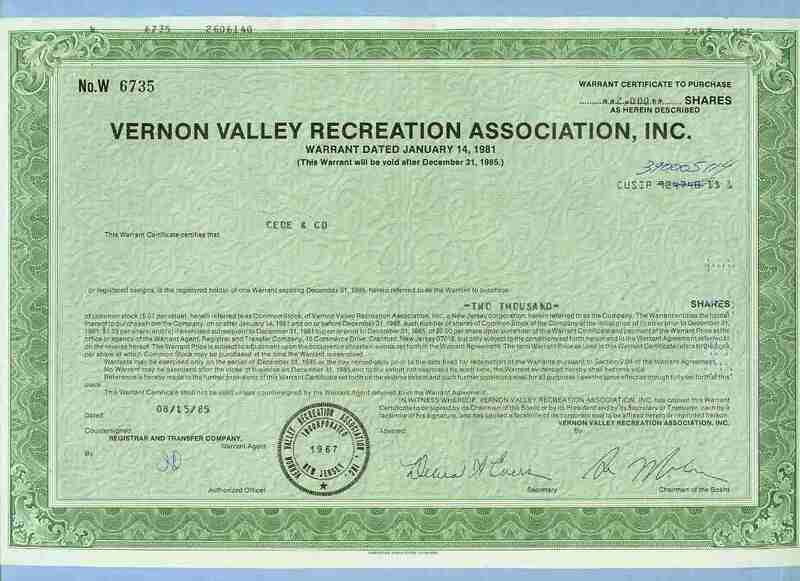 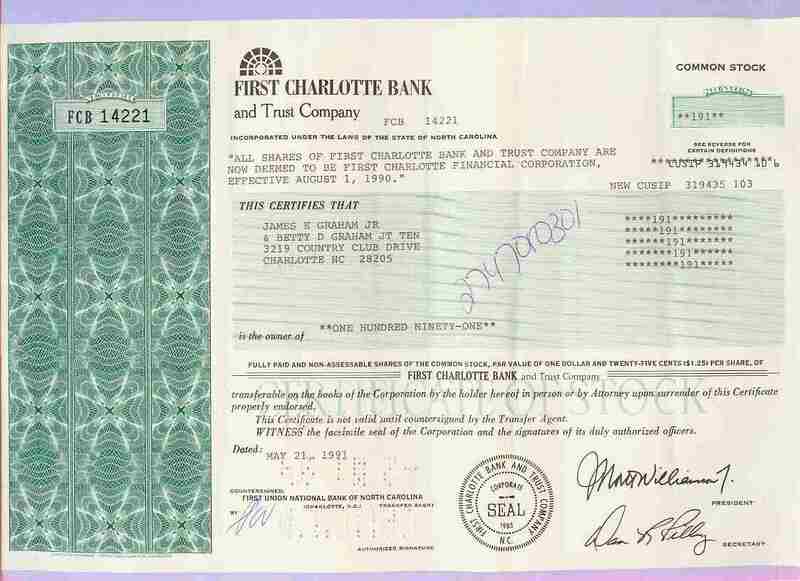 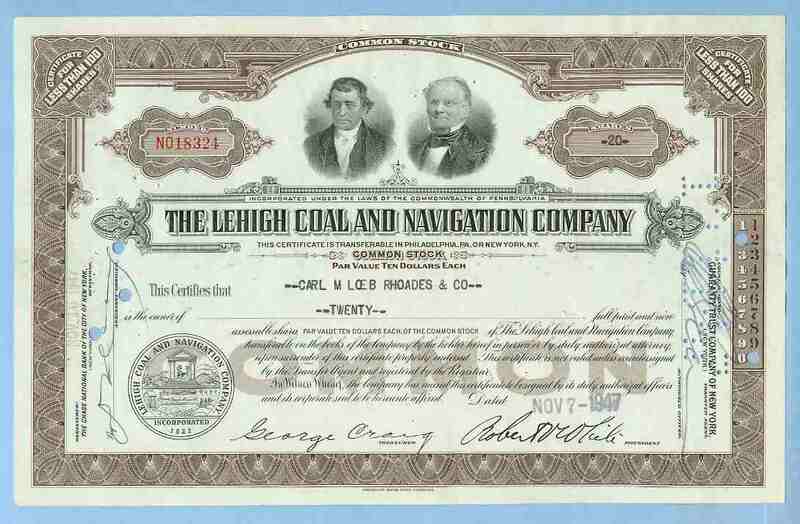 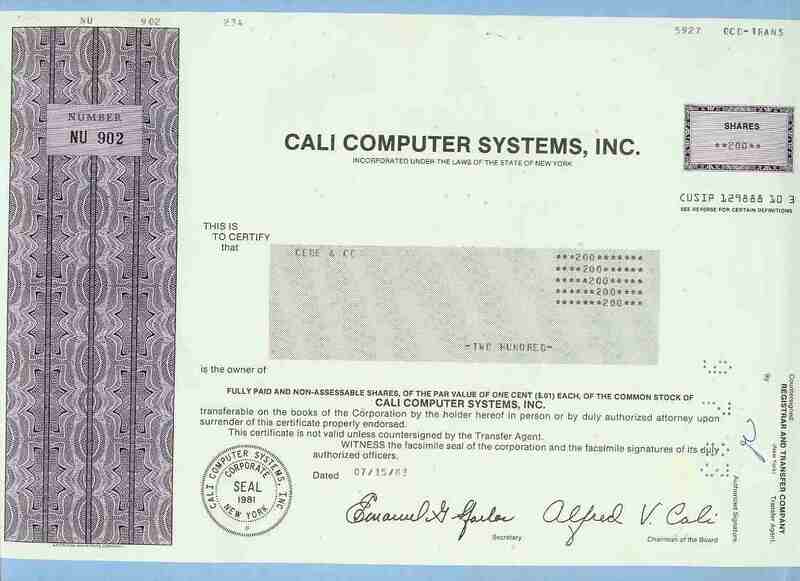 Many collectors like the historical significance of certificates. 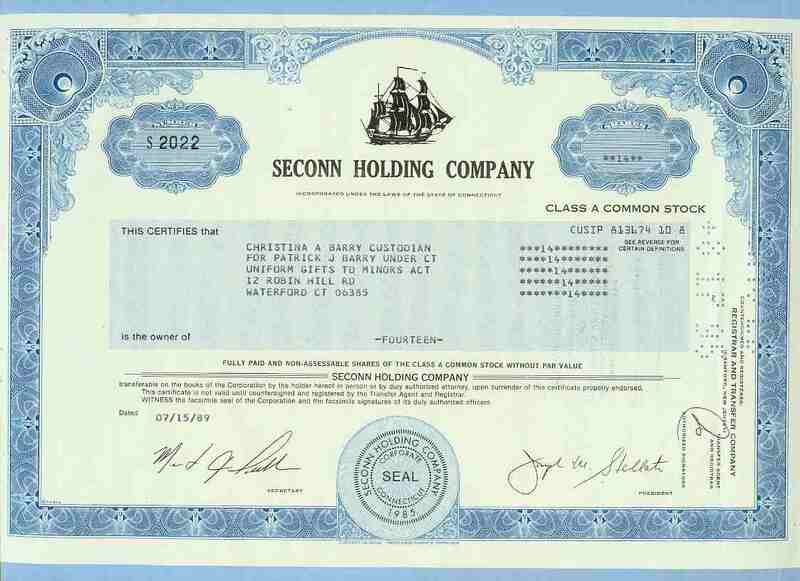 Dot com companies and scandals have been particularly popular. 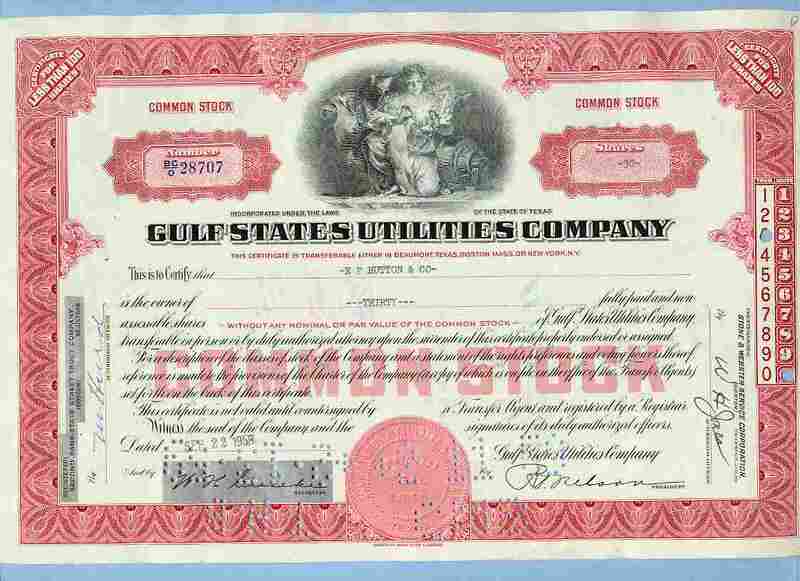 Others prefer the beauty of older stocks and bonds that were printed in various colors with fancy artwork and ornate engraving. 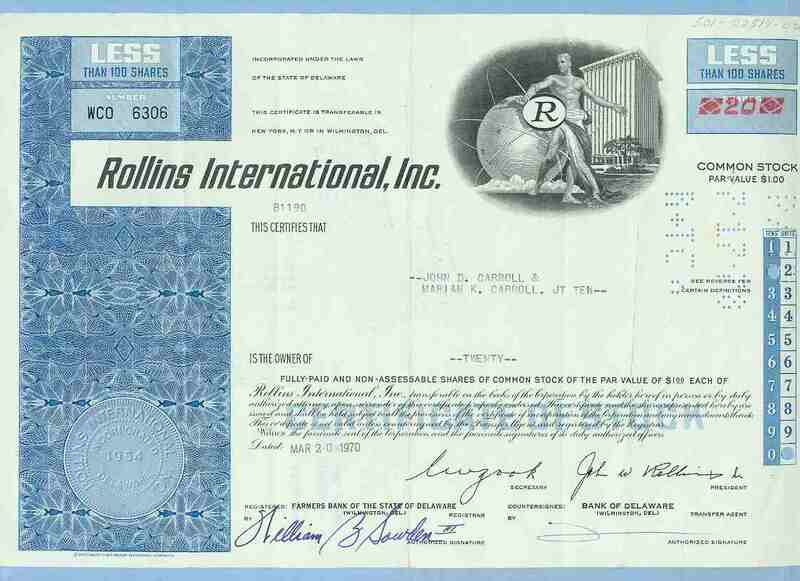 Many autograph collectors are found in this field, looking for signed certificates from John D. Rockefeller of Standard Oil Company, Henry Carey of the Franklin Fire Insurance Company, Ringling Brothers and Barnum & Bailey Circus, Atari Corporation, Eddie Rickenbacker as president of Eastern Air Lines, Broadband.com, Tucker Corporation and many others. 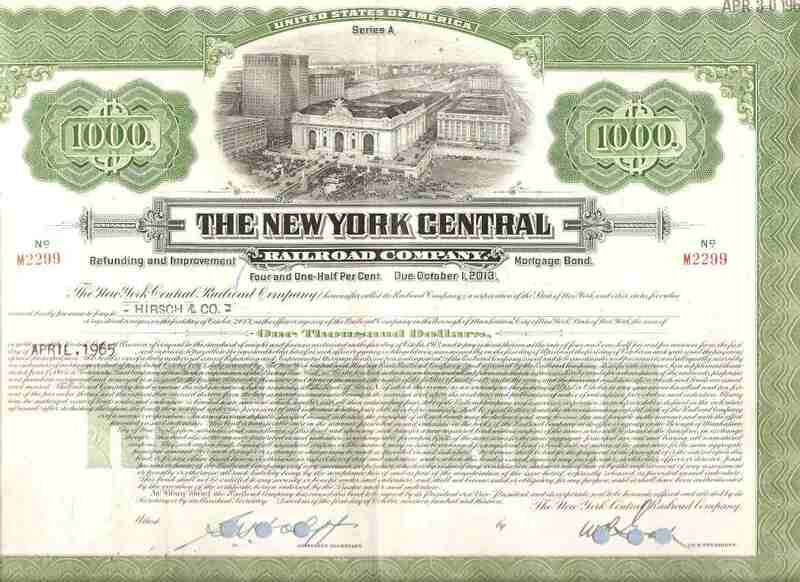 A large part of scripophily is the area of financial history. 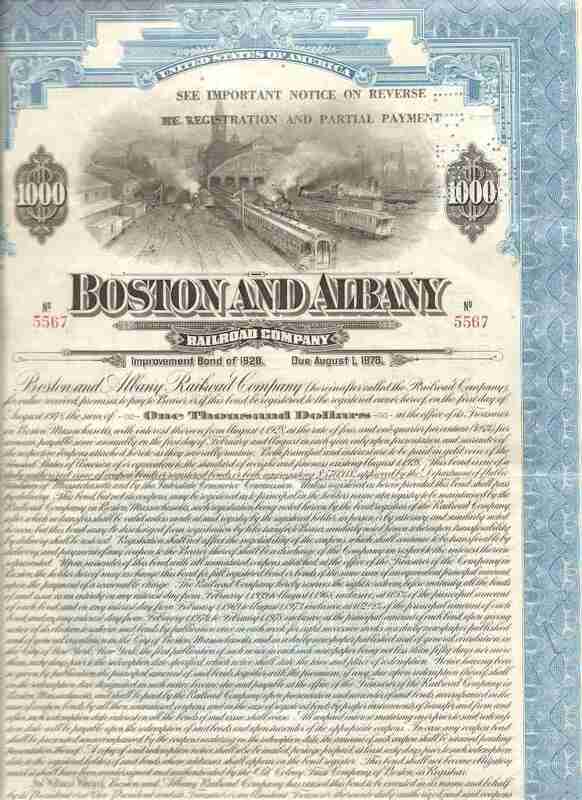 Over the years there have been millions of companies which needed to raise money for their business. 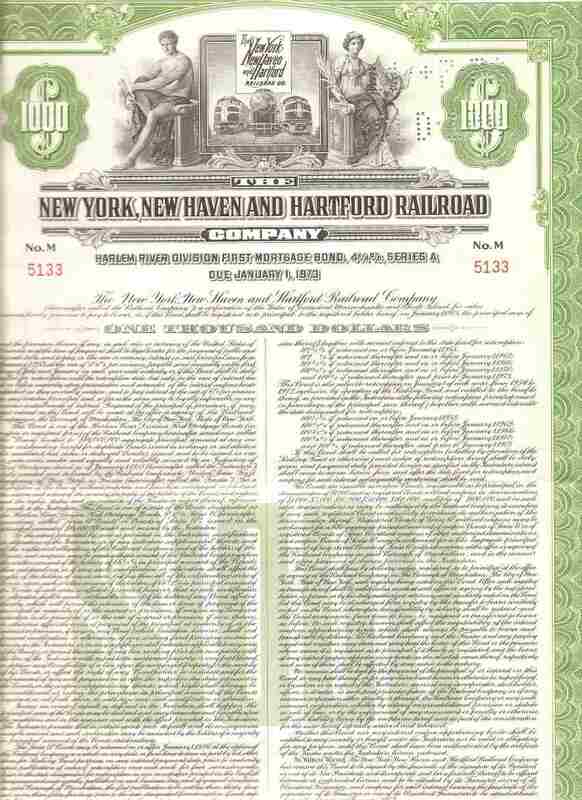 In order to do so, the founders of these companies issued securities. 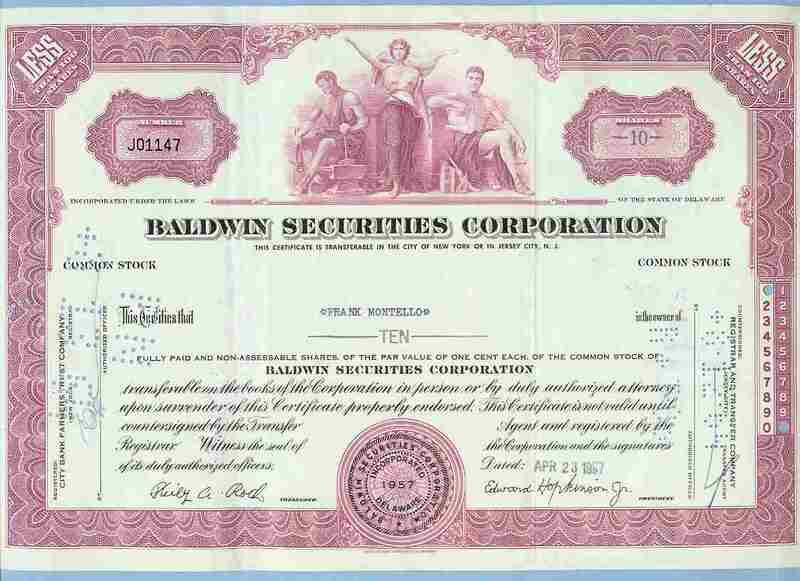 Generally speaking, they either issued an equity security in the form of stock or a debt security in the form of a bond. 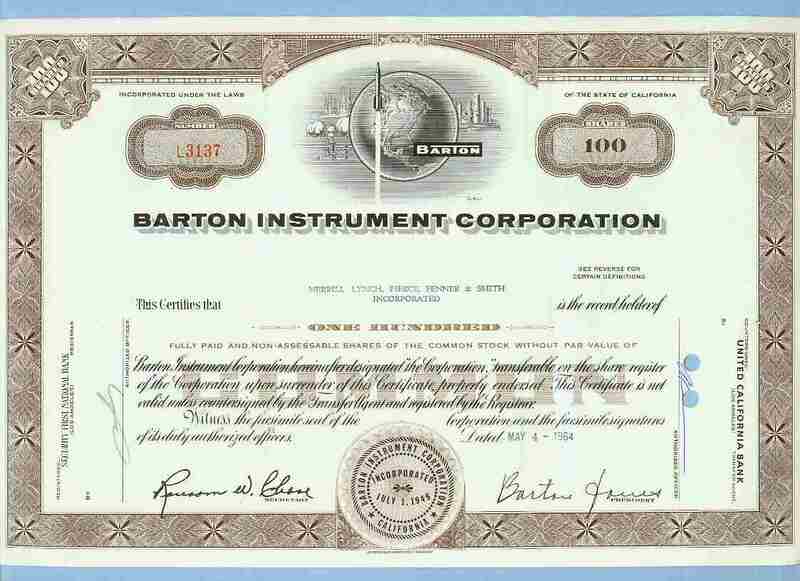 However, there are many varieties of equity and debt instruments. 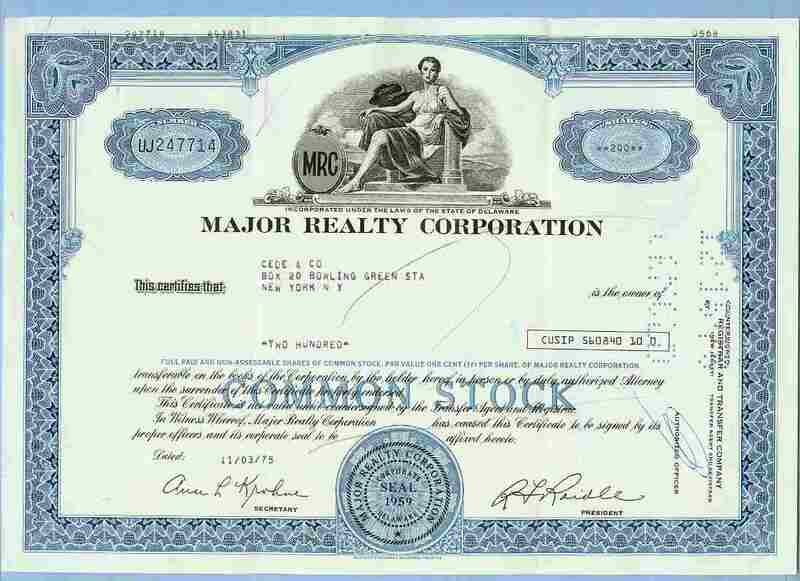 They can be common stock, preferred stock, warrants, cumulative preferred stocks, bonds, zero-coupon bonds, long term bonds (over 15 years) and any combination thereof. 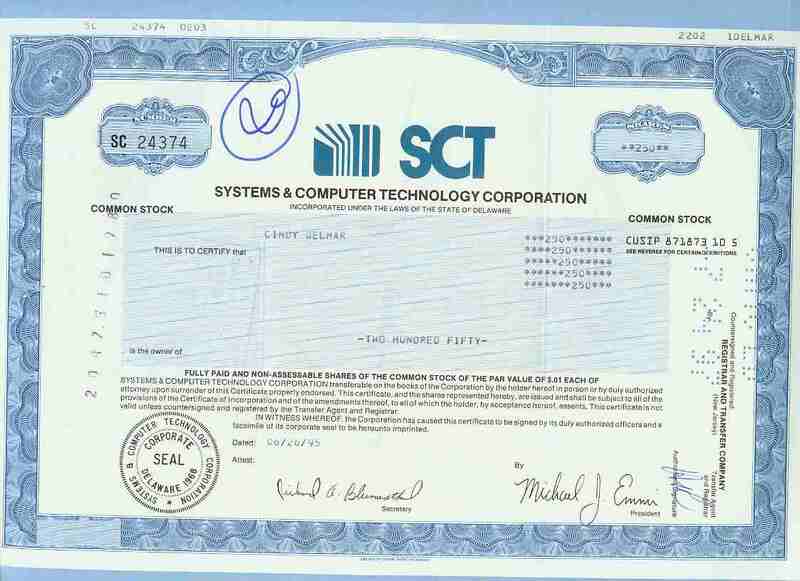 Each certificate is a piece of history about a company and its business. 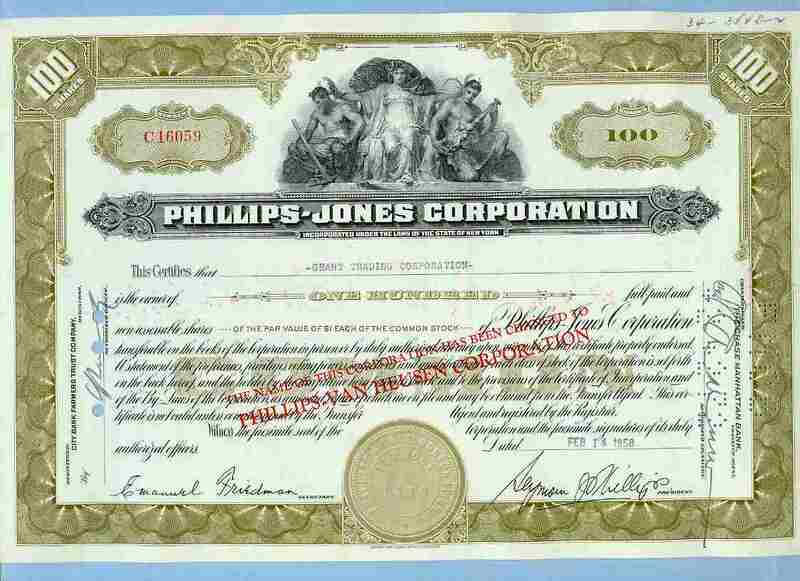 Some companies became major successes, while others were acquired and merged with other companies. 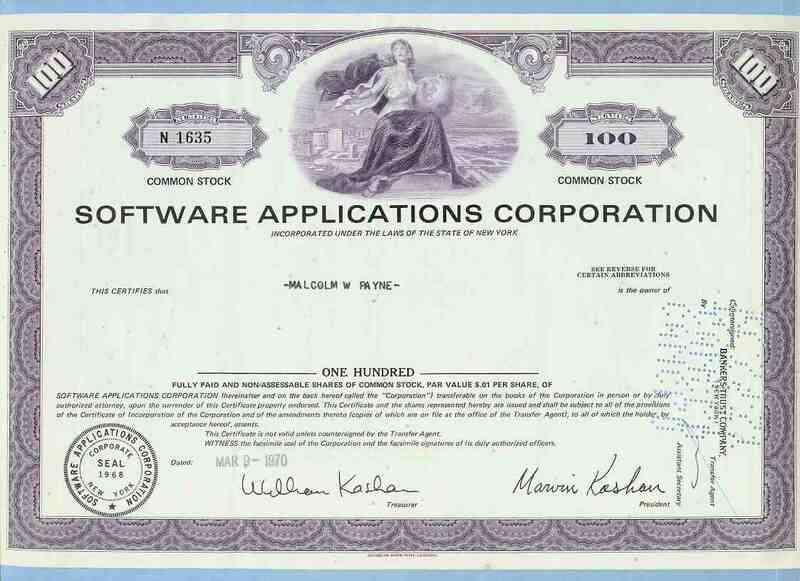 Some companies and industries were successful until they were replaced by new technologies. 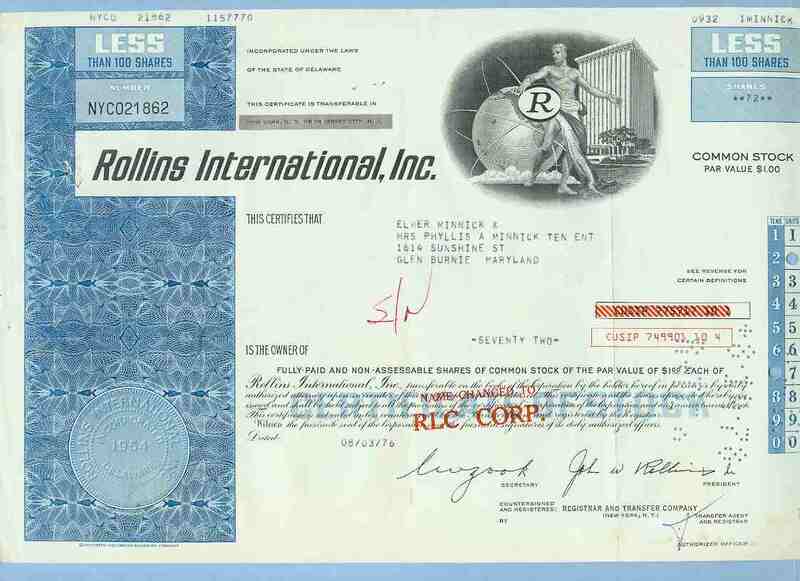 The color, paper, signatures, dates, stamps, cancellations, borders, pictures, vignettes, industry, stock broker, name of company, transfer agent, printer, and holder name all add to the uniqueness of the hobby. 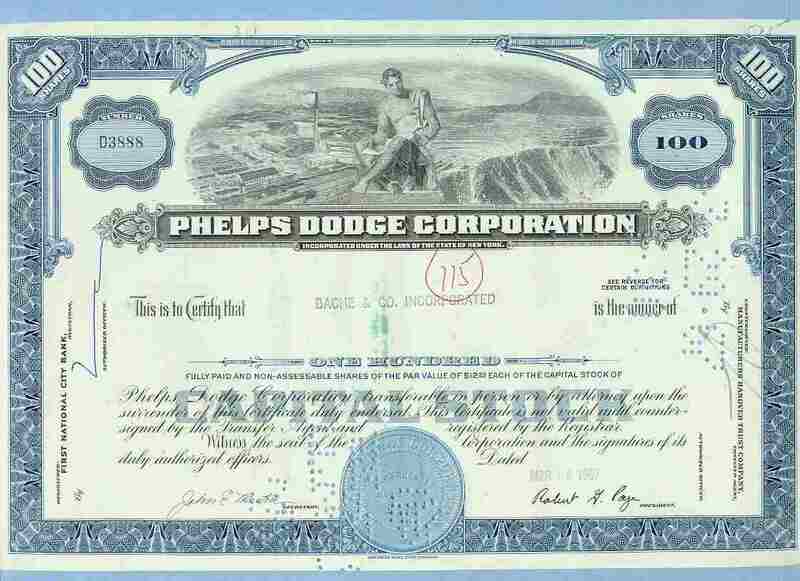 A lot of companies either were never successful or went bankrupt, so that their certificates became worthless pieces of paper until the hobby of scripophily began. 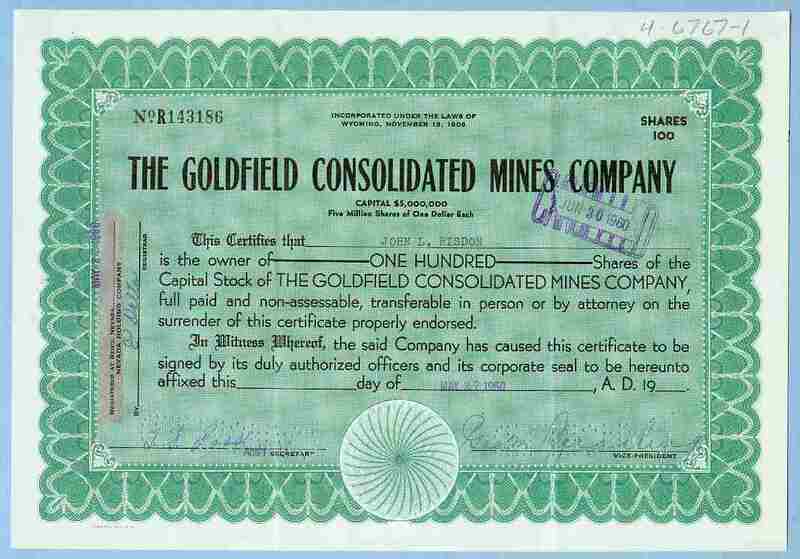 The mining boom in the 1850s, railroad construction in the 1830s, the oil boom in the 1870s, telegraphy (1850s), the automobile industry beginning around 1900, aviation (around 1910), electric power and banks in the 1930s, the airline wars and mergers in the 1970s, cellular telephones (1980s), long distance telephone service in the 1980s and 1990s, and most recently the Dot-com era and Enron all resulted in historically significant certificates being generated and issued. 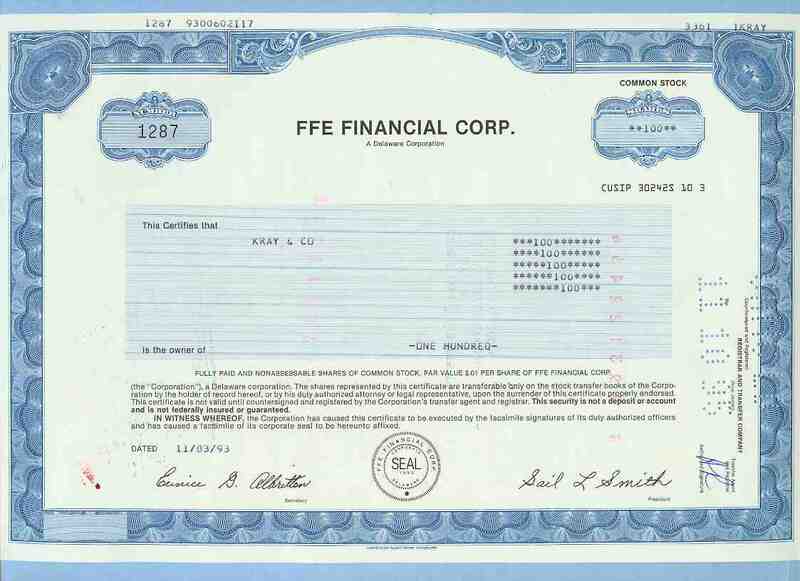 With the existence of the Internet, more and more stocks and bonds are issued electronically, meaning fewer paper certificates are issued as a percentage of actual stock issued. 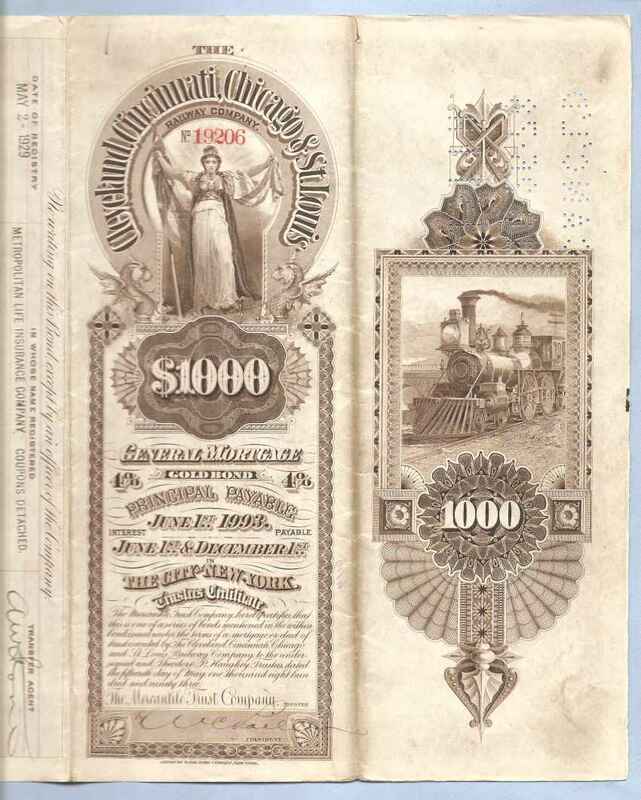 However, the Internet has also played a major role in creating awareness of the hobby as can be seen at Scripophily.com. 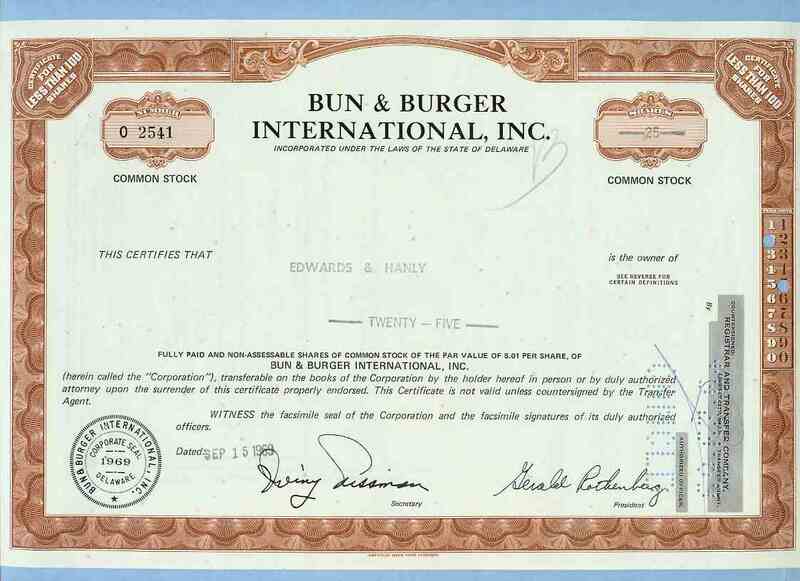 Company: Bun & Burger International, Inc.
Company: Diamond Shamrock R&M, Inc.
Company: Rollins Environmental Services, Inc.
Company: Black Angus Franchise System, Inc.
Company: Spiral Metal Compan, Inc.
Company: Vernon Valley Recreational Association, Inc.
Company: Bell Montain Silver Mines, Inc.
Company: Fountain Powerboat Industries, Inc.
Company: Bull & Bear Group, Inc.
Company: Cali Computer Systems, Inc.
Company: Industrial Electronic Hardware Corp.
Company: PSI Programming And Systems, Inc.
Company: San Juan Racing Association, Inc.
Company: First Virginia Banks, Inc.